PRICE Adjustment. Spectacular SINGLE LEVEL home on cul-de-sac. NO HOA or Mello-Roos. Major remodel both inside & out with exquisite finishes. Bamboo & tile flooring no carpet. The finest gourmet chef's kitchen. 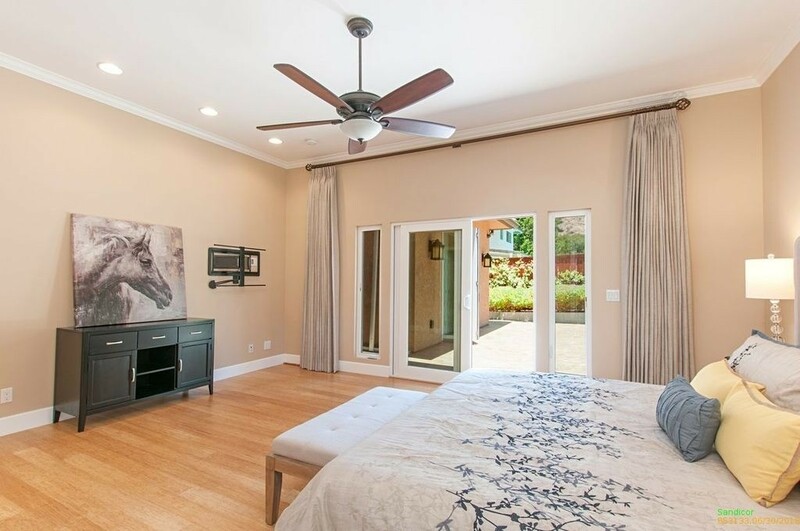 5 spacious bedrooms (two master suites) & luxurious remodeled baths plus .. amazing California indoor/outdoor cabana room with fireplace, dual overhead heating, built-in grill & folding glass doors on two sides allowing for grand entertaining. Solar electric (paid). One of a kind. This home has too many upgrades to list. 4 page upgrades list at property. 878 sq.ft. of additional living space was added (with permits) in 2014. Home comes with option to immediately join highly desirable Scripps Ranch Swim and Racquet club within 30 days close of escrow (5 year waiting list). Only the finest of finishes and appointments were selected, this home will not disappoint. NO HOA fees and NO Mello-Roos. Seller will entertain offers between $2,999,000-$3,499,000. Tremendous value for this exquisite contemporary masterpiece overlooking the lagoon & ocean. Featuring 6 beds 7.5 baths approx. 8400 sq ft, this estate boasts floor to ceiling panoramic ocean & lagoon views from each living space. The exceptional design & attention to detail throughout offer an open floor plan & the private Four Seasons inspired resort backyard showcase a salt water pool/spa complete w/ kitchen, cabana & more breathtaking views. Welcome to 7125 Obelisco Circle, a stunning estate where no expense was spared. Home construction began in 2005 and home complete in 2008 and sellers were original owners. Featuring an exceptional design with open floor plan and floor to ceiling panoramic views, this estate is truly one of a kind. The state-of-the-art kitchen boasts Red Aspen kitchen cabinetry, Dacor, Sub Zero and Bosch together with a 500+ bottle wine room. Enjoy panoramic ocean and lagoon views from all of the main living spaces, and sit back and relax in your custom home movie theater (or enjoy the surround sound in the expansive great room). The private Four Seasons inspired resort backyard showcases a salt water pool/spa complete with a kitchen and cabana and breathtaking views. Also find a dedicated auto charging outlet in the garage – the possibilities are truly endless in this one of a kind estate. Contact today for additional information! A spectacular Alta Del Mar solar powered home in a enclave of only ten homes on the ridge of Del Mar Mesa. Magnificent valley and ocean views, surrounded by the natural beauty of rolling hills. 5288 sq. ft. of luxury in the main house plus a 800 sq.ft. pool/cabana. Amazingly landscaped with pool w/waterslide, spa with waterfall and firepit. Chefs BBQ center and even a wiffle/baseball diamond. Outstanding features and fixtures. This a knock your socks off property. Exquisite finishing throughout, walnut plank flooring, travertine, high end carpeting, custom window treatments and plantation shutters. Gourmet kitchen, center island and bar, granite counters and stainless appliances. Family room with custom TV built-ins, surround sound speakers in theater room and pool/cabana. Exquisite chandeliers. Spacious bedrooms with one suite on lower level. Theater room with surround sound, mounted projector and 100" TV. Master bedroom with built-in cabinetry, TV and surround sound. Fabulous pool side cabana with glass fold back panoramic doors, mounted TV, fireplace, stainless appliances, half bath plus outdoor shower. Entertainers BBQ with custom pizza oven. Fenced property. Firepit. Beautiful landscaped grounds. Gorgeous pool with waterslide, spa with waterfall and fenced wiffle ball/baseball diamond. Beautifully landsaped lot. Ideally located on a culdesac in the highly sought after Del Mar Mesa, Bougainvillea community, this classic California property with casita offers mature landscaping in a private setting. This home lives much like a single level with a master suite and two secondary bedrooms on the first floor, while upstairs there is home theater and another ensuite bedroom. A charming gated courtyard, pool w/ water slide, putting green and grassy play area make this home a wonderful place to gather friends and family. On a quiet cul-de-sac in the Bougainvillea community, classic California property offers mature landscaping in a private setting. The charming gated courtyard with fireplace and fountain welcomes guests to the detached casita and entrance to the 4 bedroom main residence, a perfect home for entertaining and day-to-day living. The formal living and dining area with custom built-ins and wine storage, has sets of French doors leading to a back garden and entertainment areas. Spacious chef’s kitchen opens onto a breakfast nook and family room with fireplace and entertainment center. This home lives much like a single level with a comfortable Master Suite & two secondary bedrooms on the first floor, while upstairs is an expansive state-of-the-art movie theater and another spacious bedroom. An exceptional home to gather friends and family for outdoor fun with a swimming pool with a water slide, outdoor dining and lounging areas, putting green & grassy play area. The Del Mar Mesa neighborhood uniquely blends rural and refined living, offering a vast amount of equestrian, biking and hiking trails in and around the nearby Penasquitos Reserve, and the Fairmont Grand Del Mar Resort and Golf Club. Minutes to the famed beaches of Del Mar, hills of Torrey Pines and easy access to the 56 and I-5 freeways, business centers and schools. A prime opportunity is yours to own this luxurious gated estate situated on an acre in Rancho Santa Fe’s Hacienda community. Enter through the artful grand doors to this 5,791 square foot customized home. Enjoy the massive volume ceilings, sunken living room, raised formal dining room and amazing library. The stone floors lead you past many art niches. The chef's dream kitchen includes a Thermador 6-burner (plus griddle) range and double oven, SubZero refrigerator, vegetable sink, large pantry ... ... an entertainer’s island and refrigerated wine room. The open kitchen joins the stately family room with an extraordinary stacked stone fireplace commanding your attention as it stretches from the floor to the volume ceiling. A great wet bar completes the room. The master retreat wing includes expansive ceilings, a fireplace, sitting area, artwork niches, and an amazing spa bath. Some of the furniture, like this home, were custom-built for the spaces and several pieces convey! In addition to the three bedrooms and library is a “50's” themed room. Complete with ensuite bath and a wet bar this could serve as a second master suite, fourth bedroom or a home theater. The magnificent pool, spa, mature landscaping surrounding. The loggia, with its retractable awning, create an entertainer’s paradise. Rare offering in Sage Canyon School District. Wonderful home on an incredible canyon view lot with a newer swimming pool. This gem has a fantastic outdoor entertaining area with a new pool added in 2015 featuring a waterslide, waterfall, and spa. The lot has expansive canyon views. This is a great opportunity to enjoy the best of California living. The home features five bedrooms and three bathrooms. Easy walk to Sage Canyon school and easy access to both the 56 and I-5. Easy to show. Been waiting for one of the BEST locations in all of North Coast Village? Here it is! OUTRAGEOUS OCEAN VIEWS from the living room, dining area, kitchen, & master bedroom of this one-of-a kind, single-story, corner BEACHFRONT cottage! West & south-facing patios, with a 300 sf wrought iron fenced patio exclusively for your use! To the west, unobstructed views of the Pacific Ocean, nightly sunsets, & marine life. To the south, the Oceanside pier twinkles at twilight. To the north, views of Catalina Island... ...and the jetty. This is the first time in 17 years this condo has been on the market! Two parking spaces, smooth walls and ceilings, bull-nosed corners, a full-size stack washer and dryer (a rarity at NCV), and tile floors throughout the condo are just a few of the many exceptional offerings in this beach paradise. The gorgeous marble fireplace, sliding doors leading to patios from the living room and dining room, and extra ocean view windows due to the corner location enhance the awesome experience of the sights and sounds of the ocean. You'll also find recessed lighting throughout, Corinthian counter tops, and a mirrored living room wall which magnifies the ocean views. Please enjoy the video of sunsets, dolphins, and other marine life taken by the owner directly from the condo which you'll find in the virtual tour under Video2. Buyer to verify all information before close of escrow. 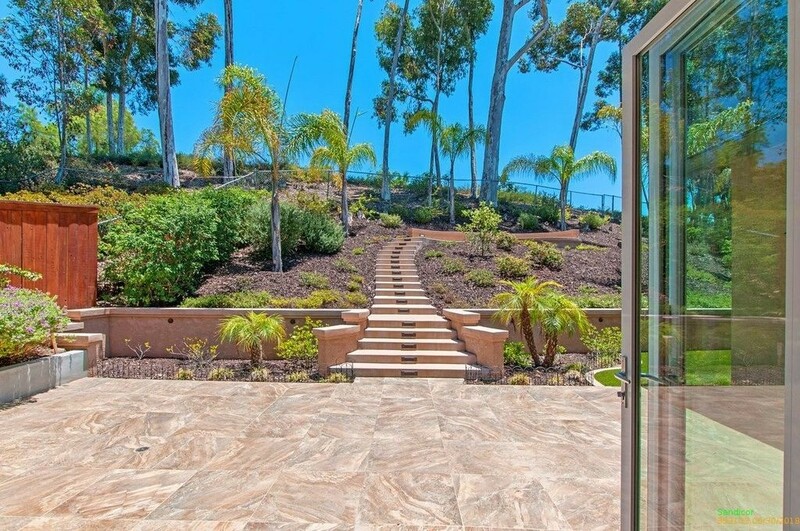 Fabulous Former Model, Belmont Plan I , with gorgeous views of Grand Del Mar Golf Course. This Mediterranean/Spanish Style Home is situated on a quiet Cul-De-Sac. Light & Bright open floor plan makes you feel like you are in your vacation home. Offers 5 bedroom 3 Full baths with one bed/bath downstairs to accommodate your guests. The three car Tandem Garage offers more storage and flexibility. Maintenance Free landscaping, Energy Efficient with Solar and artificial turf. Award Winning Del Mar Schools! This home has had one owner and is rare to be able to own a home on the golf course side for under $2,000,000. This home was a former model that was built on a large lexington lot which offers 7,144 SF of yard. Needs a bit of TLC and updating. Seller is motivated. Love a spectacular view and want to sleep to the sounds of the ocean? Then this ocean front 2 Bedroom/2BA condo is for you. Rarely on the market, this could be love at first sight. The large patio is a bonus to enjoy the panoramic views and ocean breezes. The kitchen is upgraded with granite counters and stainless appliances. New custom windows, window coverings, waterheater and A/C. Lot's to love and only minutes to the heart of La Jolla for fine dining and shopping. All one level, unit located on 3rd floor with easy elevator access. This unit also has a large private storage locker. Finally, a BEACHFRONT cottage for sale at North Coast Village! And a great one too - 2nd story corner unit with panoramic ocean views & extra windows. You'll enjoy many hours sitting on your balcony watching the sailboats, surfers, & marine wildlife. This has NOT been a rental, but lovingly cared for & furnished by long-time owners. Gorgeous wood-look tile floors, custom window treatments, & remodeled kitchen. The charming Cape Cod style furnishings are included! 24-hr guarded security. Located between Oceanside Harbor and Oceanside Pier, North Coast Village is a tropical oasis on the Pacific Ocean. The oceanfront complex consists of nine 4-story buildings surrounded by 2-story cottages on several acres of beautifully landscaped grounds. Enjoy the waterfalls, streams, Koi ponds, and paths through the lush landscape that make you feel you've just stepped into Maui! You are just steps from the sand. Swim in the large heated pool (one of two pools and spas), or enjoy a romantic walk on one of the most beautiful stretches of beach in Southern California. Experience spectacular sunsets and enjoy a relaxing dinner along the picturesque adjacent harbor which features several excellent restaurants, great live music, and fun and unique shopping. There are also kayak, boat, and paddle boat rentals, as well as fishing or whale watching excursions. At the end of the Oceanside Pier you'll find Ruby's, a fun family restaurant. North Coast Village offers billiards, ping pong, a fitness center with sauna, a putting green, and a barbecue area overlooking the pool for parties. You will also find reserved garage parking, cable television, recreation center, clubhouse with a kitchen, massive stone fireplace and cedar walls, and laundry facilities. Buyer to verify all information before close of escrow. Seller will entertain offers between $1,239,000-$1,289,000. Tremendous value for this stunning highly upgraded home on large lot w/ breathtaking panoramic views. Featuring 4 beds 4 baths & approx 2924 sq ft of living space. Downstairs features soundtech floating planks near entrance, full bed & bath, double stacking pocket doors to covered patio. Gourmet chefs kitchen includes beautiful dark wood kitchen w/ quartz counters, large island, upgraded light, walk-in pantry. Upstairs showcases loft + lux master Welcome 15874 Anjou Ln, a gorgeous upgraded home sitting on a large lot with breathtaking panoramic views. Featuring 4 bedrooms, 4 bathrooms + office and approx. 2,924 sq ft of living space. Downstairs features Sound-Tech floating planks near entrance, full bed and bath, double stacking pocket doors to covered patio. Gourmet chefs kitchen includes beautiful dark wood kitchen with quartz counters, a large island, upgraded light, walk-in pantry. Upstairs showcases a loft w/ custom built ins, a luxurious master suite and walk in closet. Out back find an entertainer’s dream, with a spacious private backyard with custom outdoor stone seating, firepit, waterfall and LED light features, stunning paver blocks, built-in BBQ, sink table and breathtaking panoramic views. Also included is a 2 car garage with epoxy floor. The open space by the backyard is a protected space for rare species of plants and its not planned for future development. Zoned to the acclaimed Poway Unified School District, convenient access to major freeways including the I-15 and SR-56, shopping, parks and beach. New on Market. Delightful open floor plan, high ceilings with lots of light, located on a cul-de-sac and premium lot. The easy-living design with a family room/kitchen combo is sure to please. 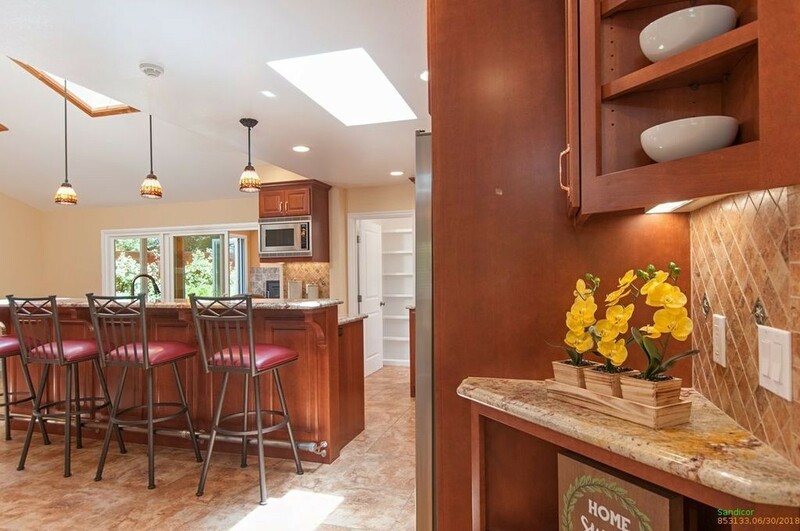 Curved granite center kitchen island, spacious bar seating and high end appliances. 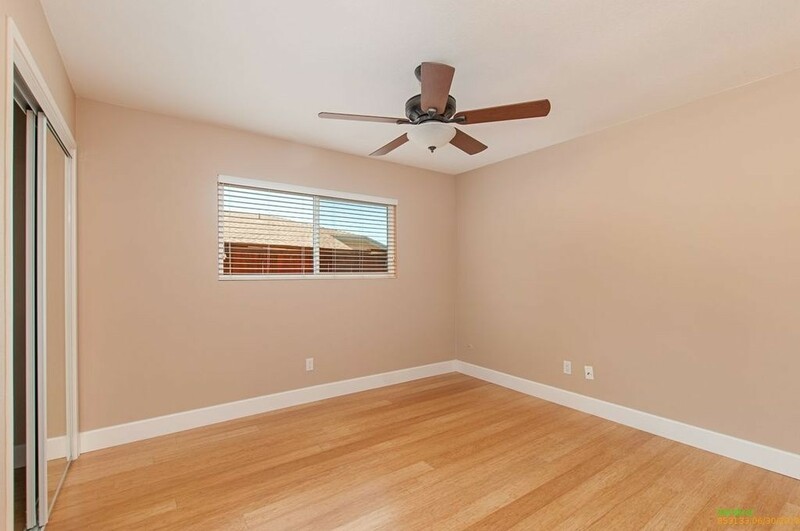 Gleaming wood flooring, plush carpeting and custom window treatments though out. Bedrooms are spacious, 3 Bedrooms up + loft with built-ins, and one bedroom on main level. Beautiful private yard with BBQ and Spa. Loaded with upgrades: Solar system-owned. Crown molding, Hunter Douglas silhouette custom blinds, security system, upstairs turret area features - custom built-in cabinetry for TV and storage. Surround sound system in family room and loft area. French doors to balcony off master bedroom suite. Upgraded bathrooms with designer tile and glass shower doors. Framed mirrored wardrobe closet doors in all bedrooms. A/C. Three car garage (one tandem) with epoxy floor, extra lighting and California closet storage cabinetry. Outdoor custom spa, outdoor BBQ center. Walking distance to award winning schools. Membership to the Pacific Highlands Community Rec. Center with pool/spa, clubhouse, gym. Minutes to shopping, movies, library and dining. Move in ready. Bright and sparking, adjoining open space, this property shines. The beautifully landscaped grounds are a fitting introduction to a superb interior. Meticulously maintained 5 BR (one BR downstairs with full ensuite Bath), boasts many features that are sure to please. With a spacious, easy-to-live in floor plan and private backyard, it is ideally planned for effortless entertaining. Award winning DMUSD & San Dieguito School district. Close to freeways, beaches, shopping and dining. See suppl. This home features a great sized kitchen with ample work space, island counter, walk in pantry and plenty of cabinet space. 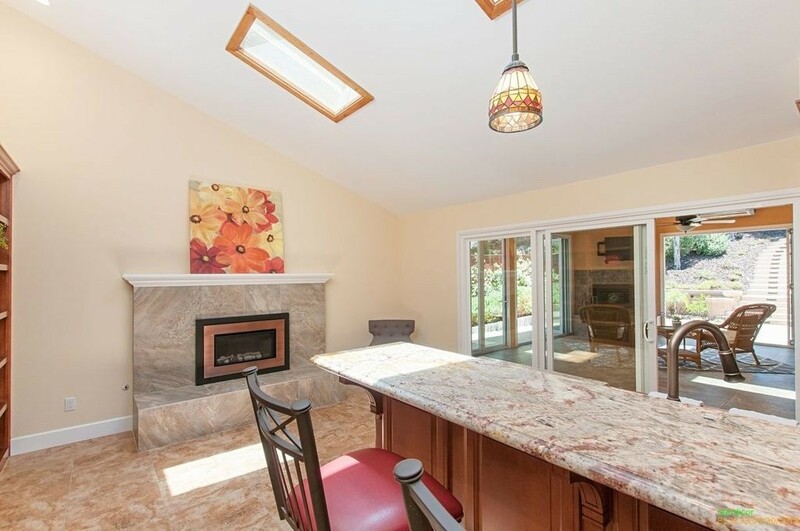 The adjacent family room with fireplace is generous in size for any active family. The living room and dining are elegant with vaulted ceilings and custom window treatments. The guest suite on the main floor has it's own ensuite private bath, plus there is a separate powder room for guests. The upstairs bedrooms are bright and airy with a luxurious master bedroom that can accommodate the most lavish furnishings. Additional features include - two A/C units for dual zone control, new washer/dryer, tankless gas water heater, custom window treatments, upgraded carpeting, surround sound, plus an alarm system. There are two master closets and a large linen closet, the garage has epoxy floors. There is much this home has to offer. LUXURIOUS LIVING AT WATERPOINT IN LA PLAYA, POINT LOMA, JUST ONE BLOCK TO AMERICA'S CUP HARBOR. MODERN DESIGN WITH HARDWOOD FLOORS AND HIGH CEILINGS THROUGHOUT. MAIN FLOOR HAS AN OPEN FLOOR PLAN W/ LA CANTINA DOORS LEADING TO A LARGE, SUNNY TERRACE, CREATING AN EXPANSIVE SPACE, INCLUDING LIVING/DINING ROOMS AND A WONDERFUL CHEF'S KITCHEN WITH HUGE ISLAND, QUARTZ COUNTERS AND BOSCH APPLIANCES. A GREAT HOME FOR ENTERTAINING OR RELAXING! 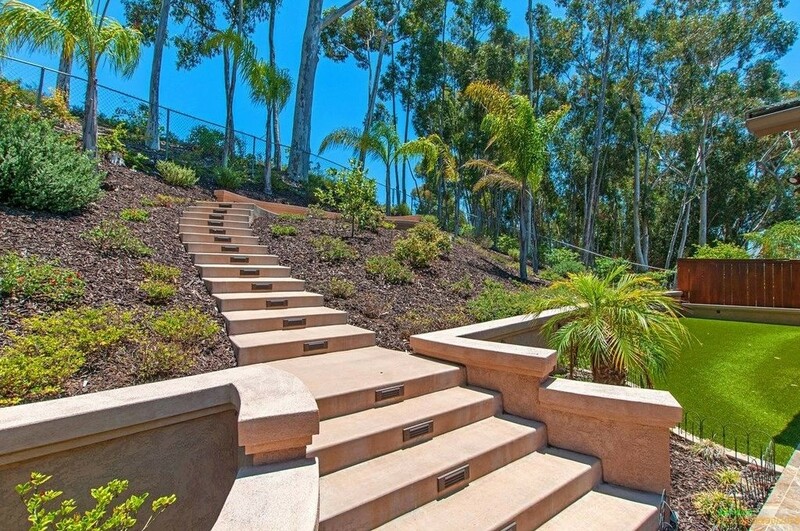 JUST STEPS TO THE BLUE WATER OF SAN DIEGO BAY! PRIVATE PATIO W/FIREPLACE! EN SUITE BEDROOM ON FIRST FLOOR! SPACIOUS MASTER SUITE! 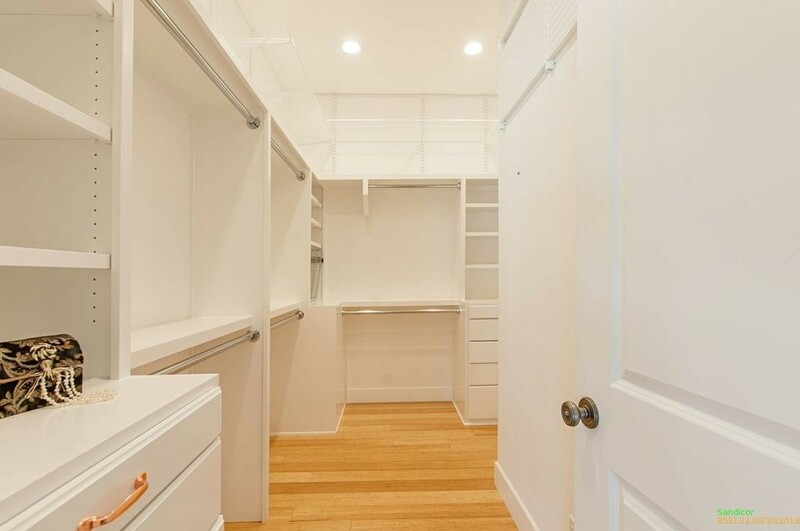 MULTIPLE WALK-IN CLOSETS! GATED, INDOOR GARAGE! WALK TO BEACHES AND CLUBS ON SHELTER ISLAND AND RESTAURANTS AND SHOPS IN POINT LOMA VILLAGE! CONVENIENTLY LOCATED MINUTES TO LIBERTY STATION, AIRPORT, DOWNTOWN SAN DIEGO CULTURE AND AMENITIES. Priced to Sell!! Amazing price for a coastal property just steps from the beach. Walk out this privately gated home just moments to the beach and enjoy the coastal life-style in this beautifully updated property. A must see! This is a beautiful clean home meticulously maintained. This 3 bedroom, 3 bath gated home offers a spacious open floor plan with high ceilings, lots of storage, garage, privacy and partial ocean views. The master suite offers a double vanity, separate shower and shower/tub, walk-in closet and balcony. Granite counter tops, bonus room complete with walk-in closet and built-in murphy bed easily converted to a downstairs master suite, garden bed and built-in grill along side the ceramic tile patio, sprinkler system, kitchen fully equipped with viking appliances, built-in microwave, large island. Fabulous private retreat nestled on 3/4 acres in the coveted Queensgate, gated community. Exceptional lifestyle awaits you in this highly upgraded single level contemporary ranch style home. 3BR+library/BR. Resort like home makes you feel like you are living in another world, set in a peaceful wooded area this private home is exceptional. High-end custom appointments throughout, granite counters, Dacor appliances, distinctive fireplaces, remote control shades, custom cabinetry and designer bathrooms. The beautifully landscaped coral tree at the entry sets the stage for the stately grounds. A double row of mature palms, lush landscaping, easy care turf and gravel walkways through the vibrant greenery, gives a sense of peace and tranquility. Enjoy your own fruit trees of orange, lemon, grapefruit as well as a fragrant floral garden. A pillar supported pergola with bougainvillea, custom hardscape with earth toned pavers, built-in BBQ for alfresco dining and fish (koi like) pond with fountain beautifully decorated with Italian tile for a dramatic touch. Highly upgraded interior....too many special features. The kitchen is a cooks dream with Dacor appliances and oversize island. Big windows and Lofty ceilings in the living room, built-in cabinetry for those special show pieces along with remote control shades. A luxurious master suite with sitting area. Luxurious bath and walk-in closet with his/her built-ins ...this home is exceptional both inside and out providing the perfect retreat. Stunning ocean, jetty, harbor, mountain, and river views from this gorgeous, rare three-bedroom condominium! Fully remodeled with granite counters, s/s appliances, crown molding, new designer furnishings and bedding, two parking spaces and washer/dryer, this home grossed more than $70,000 in its first year of vacation rentals! The west-facing master retreat has two walls of windows showcasing the wrap-around panoramic views. Truly one of the most magnificent penthouse settings from Oceanside to La Jolla! Additional upgrades include: washer and dryer in unit, all new dual pane vinyl windows and doors throughout the condo, granite fireplace, recessed lighting, ceiling fans, designer paint, and jetted tub in downstairs bath. Master bedroom chairs and pictures do not convey. Located between Oceanside Harbor and Oceanside Pier, North Coast Village is a tropical oasis on the Pacific Ocean. The complex consists of nine three-story buildings surrounded by 2-story cottages, on several acres of beautifully landscaped grounds with waterfalls, streams, Koi ponds, and putting green. You're just steps from the sand; there are no roads to cross-this is an OCEANFRONT COMPLEX! Swim in the Olympic-size heated pool (one of two pools and spas), or enjoy a romantic walk on one of the most beautiful stretches of beach in Southern California. Experience spectacular sunsets and enjoy a relaxing dinner along the picturesque adjacent harbor which features several excellent restaurants, great live music, and fun and unique shopping. There are also kayak, boat, and paddle boat rentals, and fishing or whale watching excursions. At the end of the Oceanside Pier you'll find Ruby's, a fun family restaurant. North Coast Village offers billiards, ping pong, a fitness center with sauna, and a barbecue area overlooking the pool for parties. You will also find reserved garage parking; cable television; recreation center; clubhouse with kitchen, massive stone fireplace and cedar walls; laundry facilities. Buyer to verify all information before close of escrow. Spectacular and Immaculate ocean view condo for sale. 640 Solana Circle W.#15, Solana Beach, CA 92075,. 2bd 2ba 1254 sq ft., top floor, end unit, skylight, cathedral ceiling, attic storage, Clubhouse, pool, 2 parking spaces. Many beautiful and lst class upgrades. Minutes to Fairgrounds/race track, beaches, shopping and is in a quiet community. $1,050,000. Be sure to check out 3D Tour! Ideally located in a quiet, safe, & friendly neighborhood. Situated next to a lovely park, this gorgeous home offers 4 bedrooms, plus den(optional bed), 3 baths & intuitive layout w/wonderful spaces for relaxing or entertaining. Inside, a pleasing neutral color scheme, hardwood floors, lofty ceilings & fine fixtures welcome you home. A beautiful living/dining area features an inviting, open concept w/vaulted ceiling, grand second story overlook...See Supplement for more! ...elegant dining & many large windows which afford the space generous natural light. Meal preparation is a dream in the remodeled kitchen showcasing stunning granite countertops, stainless steel appliances & custom cabinets w/soft close doors & drawers, great center island/breakfast bar, & attractive travertine tile floor. Gather around the cozy fireplace in the adjoining family room for some quality time w/friends & family. A guest bed/bath & quiet office complete the main floor. Rest peacefully in the luxurious master bedroom boasting magnificent mountain views & spa style ensuite bath w/dual vanities, separate shower & soaking tub. Also find two spacious bedrooms plus convenient laundry room on this floor. Outside, your private oasis awaits. 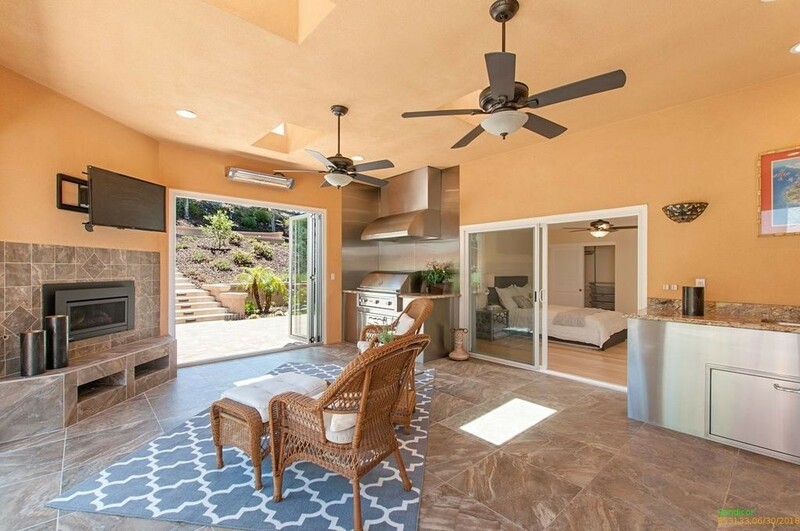 Unwind on the private back patio, surrounded by beautiful gardens, take in amazing views of the scenic landscape & distant Calavera Mountain while the sunsets or moon rises. Lovely private setting w/abundant bird watching & no neighbors to one side & behind the property. Enjoy over 500 acres in the Lake Calavera Preserve, hiking trails w/endless views from the top of Mount Calavera. Excellent schools, Primary to High School are all within walking distance, plenty of restaurants & shopping are conveniently located just minutes away, Tamarack beach is less than 5 miles away! Back on the market due to buyer's failure to perform. A mere 100 feet separates the sand from the front door of this west-facing 2 bedroom beach home. Experience wonderful ocean views from the living room, both bedrooms, and the balcony. The furnishings and fixtures convey with it! The master retreat has an ocean view patio and a beautifully upgraded master bath. Generous upgraded countertop space and matching backsplash lines the kitchen, which opens to the dining area with stone travertine floors. The small, gated Pacifica Strand complex offers amazing access to one of the best beaches in Southern California. Famed among surfers, Oceanside Beach is directly across from this condominium. This home has both a balcony and patio to enjoy amazing ocean and beach views. The master retreat enjoys ensuite access to the bathroom and ocean views. Washer and dryer are located within the unit and are in the condo for your convenience. Situated nearly equidistant between Oceanside Pier and Oceanside Harbor, attractions are abound if you manage to leave the beach! Including the nearby restaurants and shops in Downtown Oceanside, you are a short drive to shopping and Legoland in Carlsbad, and less than an hour's drive from Downtown San Diego, Balboa Park, SeaWorld, San Diego Safari Park, Dana Point, San Diego and John Wayne airports, La Jolla Cove and the Del Mar Fairgrounds. Where can you go to experience breathtaking ocean views, romantic sunsets silhouetting Catalina Island, a picturesque harbor, majestic views of the mountains, AND A SELLER GUARANTEE of $50,000 gross rental income during your first year of ownership? Eureka! This 3rd and 4th floor penthouse condominium has it all: luxurious new contemporary furnishings, upgraded kitchen & baths, crown molding throughout. The entire upper level is the master retreat & an expansive roof-top balcony. Furnishings included!! Beautifully upgraded beach condominium with gorgeous granite counter tops, stainless steel appliances, and brick-shaped tile back splash in the kitchen. 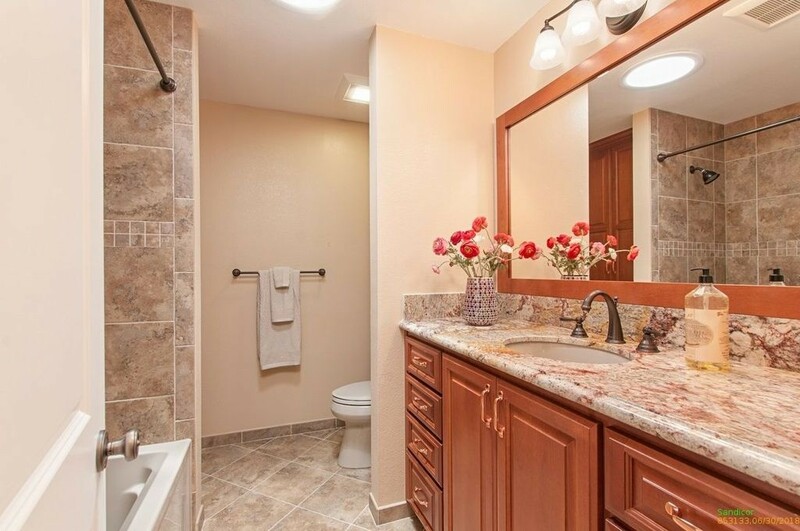 The bathrooms have the same upgraded tile, and beautiful contemporary vanities. Beautifully refurbished in 2014 with a La-Z-Boy queen sleeper-sofa, stressless chair, and two comfortable chairs. Fully equipped kitchen, 3 flat-screen TV's and DVD players. North Coast Village is located between the Oceanside Harbor and the Oceanside Pier, and is a favorite vacation destination for people from all over the world. The complex consists of nine three-story buildings on acres of beautifully landscaped grounds. You are just steps from the sand; there are no roads to cross-this is an OCEANFRONT COMPLEX! Swim in the Olympic size heated pool (one of two pools and spas), or enjoy a romantic walk on one of the most beautiful stretches of beach in Southern California. Stroll around the lush tropical grounds with streams, waterfalls, Koi ponds, and beautiful gardens. In the evening, gorgeous colored lights create a magical atmosphere. Experience spectacular sunsets and enjoy a relaxing dinner along the picturesque adjacent harbor which features several excellent restaurants, great live music, and fun and unique shopping. There are also kayak, boat, and paddle boat rentals, and fishing or whale watching excursions. At the end of the Oceanside Pier you'll find Ruby's, a fun family restaurant. North Coast Village offers billiards, ping pong, a fitness center with sauna, putting green, and a barbecue area overlooking the pool for parties. You will also find reserved garage parking; cable television; recreation center; clubhouse with kitchen, massive stone fireplace and cedar walls; laundry in building; and elevator access to all floors. The Mainstreet Oceanside Farmer's Market is a delightful experience near the Pier which takes place every Thursday from 9-1, and and the Sunset Market Thursday evenings from 5-9. Buyer to verify all information before close of escrow. These views are to-die-for. Breathtaking ocean, sand, & pier views all the way to La Jolla! This coveted, rarely available location is reserved for the discerning few who want the very best setting NCV has to offer. Situated in the ocean-close D building, this south facing condo features new sculptured carpeting, a Lazy-Boy sleeper sofa, 2 ocean view balconies, & soft ecru walls. The master retreat occupies the entire upper level, looking out to an expansive ocean-view balcony. Sold furnished! This gorgeous setting has magnificent, unobstructed ocean and sand views. The condo has many upgrades, including re-textured ceilings, new carpeting, and designer paint, and comes with 2 assigned parking spaces! North Coast Village is a favorite destination for people around the world. The complex consists of nine three-story buildings on acres of beautifully landscaped grounds. Enjoy streams, waterfalls, Koi ponds, and fountains. You will feel like you're stepping into Maui! This is an outstanding opportunity- great vacation rental. You are just steps from the sand-this is an OCEANFRONT COMPLEX! Swim in the Olympic size heated pool (one of two pools and spas), or enjoy a romantic walk on one of the most beautiful stretches of beach in Southern California. Experience spectacular sunsets and enjoy a relaxing dinner along the picturesque adjacent harbor which features several excellent restaurants, great live music, and fun and unique shopping. There are also kayak, boat, and paddle boat rentals, and fishing or whale watching excursions. At the end of the Oceanside Pier you'll find Ruby's, a fun family restaurant. North Coast Village offers billiards, ping pong, a fitness center with sauna, putting green, and a barbeque area overlooking the pool for parties. You will also find reserved garage parking; cable television; recreation center; clubhouse with kitchen, massive stone fireplace and cedar walls; laundry in building; and elevator access to all floors. Buyer to verify all information before close of escrow. Sellers will entertain offers between $849,000-$899,000. 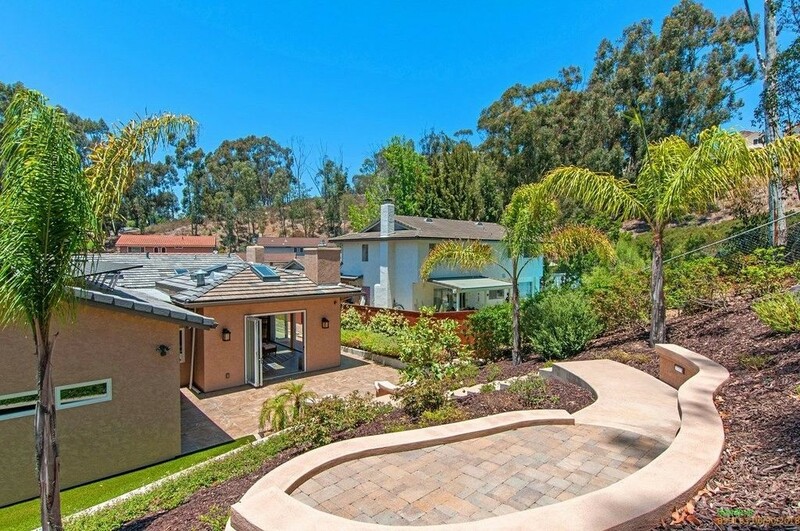 Tremendous value for this gorgeous Fallbrook multi-family home. Sitting on 1.45 acres of land this home is located near the prestigious community of Champagne Crest. The main level features a family room, living room, dining room, full size kitchen, 3beds, 2.5baths & laundry room. The lower level features its own front door, family room, full size kitchen, 2beds, 2full baths large bonus room & laundry facility. See supplement for additional info Welcome to 2230 Calle Dos Lomas, a gorgeous Fallbrook multi-family home that is like having two single story homes in one! On the main floor you will find a family room, living room, dining room, full size kitchen, 3 beds, 2.5 baths and a laundry room. The lower level features its own front door entrance, family room, full size kitchen, 2 beds, 2 full baths large bonus room and laundry facility. The entire home features slab granite countertops, travertine tile flooring, quality fixtures, custom cabinetry, upgrades to the deck flooring and a 5 car garage. The property features incredible valley and hill views with hilltop ocean breezes. There is room for RV parking in the 2nd driveway. Home sq footage is 4,830 - total living area sq footage is 5,967. Downstairs apartment suite was constructed in 2017 along with electrical and plumbing upgrades. This property is one of a kind, contact today for more information! Custom built 2 story contemporary, spacious, exceptional beauty sitting high on the hilltop with amazing panoramic & sunset views. 4 BR, 3.5 BA, living room, family room/den plus oversize recreation room. Master bedroom suite on main entry level with his/her walk-in closets. All secondary bedrooms on the lower floor. This home shines. Big kitchen with casual dining plus separate formal dining room. Big walk out deck. ...Lushly landscaped lot, with multiple fruit trees. Gated community, Cul-de-sac. Clean-lined contemporary design with cathedral ceilings. Kitchen is expertly planned with granite counter tops and ample counter space for easy entertaining. Huge walk-in pantry (plumbed for laundry) with tons of storage space. Casual dining off kitchen and formal dining room. Beautiful tile throughout the upper floor with carpet on lower level. Big walk out trex deck with new awnings, off the upstairs living room. Recreation room is also plumbed for bar. Two laundry rooms, plumbed on both levels. Fireplace and surround sound speakers in living room. Marble counters in baths. Blinds on windows throughout with custom window treatments in living room. Outside separate equipment room can be converted to bathroom for bathroom for pool or spa. Beautifully landscaped with drip irrigation and drought resistant plants, multiple fruit bearing trees. Cul-de-sac street, gated community with tennis courts and walking trails. Stunning western views of the ocean, pool, and garden dominate this fabulous, 2-story beach condominium. This penthouse home boasts numerous upgrades including granite counters, upgraded cabinetry, a fireplace, plush carpet, and most furnishings are available! Both baths beautifully upgraded with stone. This unit has TWO balconies from which to take in the fantastic views. The large, private master retreat encompasses the entirety of the upstairs with an ensuite bathroom and rooftop patio. North Coast Village offers billiards, ping pong, a fitness center with sauna, and a barbecue area overlooking the pool for parties. The complex consists of ten four-story buildings surrounded by 2-story cottages, on several acres of beautifully landscaped grounds with streams, waterfalls, and tropical gardens. You are just steps from the sand; there are no roads to cross-this is an OCEANFRONT COMPLEX! Swim in the large lagoon-style heated pool (one of two pools and spas), or enjoy a romantic walk on one of the most beautiful stretches of beach in Southern California. You will also find reserved garage parking, cable television, a recreation center, clubhouse with kitchen, massive stone fireplace and cedar walls, as well as laundry facilities. North Coast Village is located between the Oceanside Harbor and the Oceanside Pier, and is a favorite destination for people from around the world. This is a great area for riding bikes! A beautiful, scenic bike trail starts right across the street from the complex or bike along HISTORIC Pacific Coast Highway. Experience spectacular sunsets and enjoy a relaxing dinner along the picturesque adjacent harbor which features several excellent restaurants, great live music, and fun and unique shopping. There are also kayak, boat, and paddle boat rentals, and fishing or whale watching excursions. Downtown Oceanside is a neighborhood that knows its potential. With brand new renovations recently completed, new, exciting restaurants and hotels are opening all year! At the end of the Oceanside Pier you'll find Ruby's, a fun family restaurant. The Main Street Oceanside Farmer's Market is a delightful experience near the Pier which offers fresh produce every Thursday from 9-1, and the Sunset Market offering food booths from around the world and live music Thursday evenings from 5-9. Within a short drive, enjoy Disneyland, Knott's Berry Farm, Universal Studios, Legoland, Wild Animal Park, SeaWorld, San Diego Zoo, La Jolla, Balboa Park, the Gaslamp Distract and Del Mar Race Tracks. Craft beer capital of the US! Enjoy your favorites like Stone, Ballast Point and Green Flash or explore something new are creative at places like Masters in Oceanside! Don't miss this beautiful custom built home with open beam ceilings throughout - in the highly sought after Hidden Meadows neighborhood. Home sits on 1.14 acres with 3 bedrooms & 2.5 bath in the main house, along with a 1 bedroom, 1 bath apartment with a separate entrance. Attached two car garage and workshop as well as a detached 4+ car garage/workshop with RV height access and covered RV parking with full hookups. Property sits on a quiet dead-end street and is completely fenced with an electric gate. Where can you go to experience breathtaking ocean views, romantic sunsets silhouetting Catalina Island, a picturesque harbor, wildlife, & majestic views of the mountains, ALL AT THE SAME TIME? Eureka! This 3rd and 4th floor penthouse condominium has it all: a sleek, contemporary zen-like vibe, stunning, upgraded kitchen & baths, crown molding throughout. The entire upper level is the master retreat, featuring a large walk-in closet, upscale bath w/ separate dressing area, & an expansive roof-top balcony. Beautifully upgraded beach condominium with gorgeous granite counter tops, stainless steel appliances, and brick-shaped tile back splash in the kitchen. 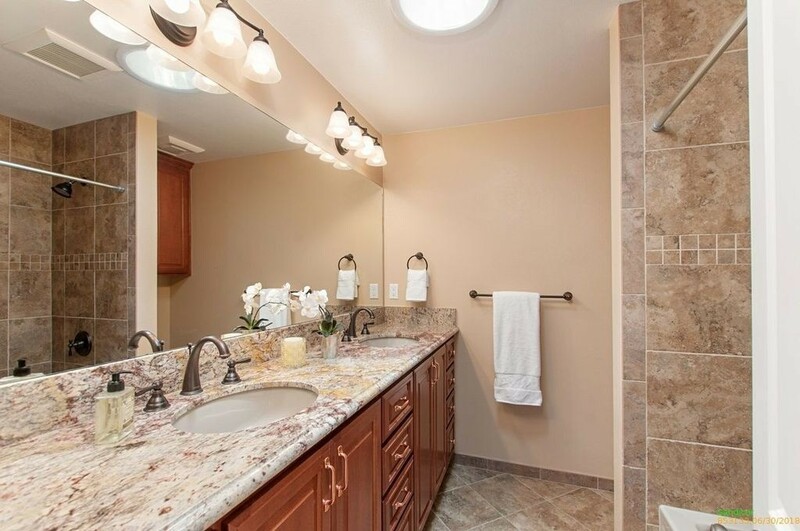 The bathrooms have the same upgraded tile, and beautiful contemporary vanities. This condo comes with 2 assigned parking spaces! North Coast Village is a favorite destination for people around the world. The complex consists of nine three-story buildings on acres of beautifully landscaped grounds. Enjoy streams, waterfalls, Koi ponds, and fountains. You will feel like you're stepping into Maui! This is an outstanding opportunity- great vacation rental. You are just steps from the sand-this is an OCEANFRONT COMPLEX! Swim in the Olympic size heated pool (one of two pools and spas), or enjoy a romantic walk on one of the most beautiful stretches of beach in Southern California. Experience spectacular sunsets and enjoy a relaxing dinner along the picturesque adjacent harbor which features several excellent restaurants, great live music, and fun and unique shopping. There are also kayak, boat, and paddle boat rentals, and fishing or whale watching excursions. At the end of the Oceanside Pier you'll find Ruby's, a fun family restaurant. North Coast Village offers billiards, ping pong, a fitness center with sauna, putting green, and a barbeque area overlooking the pool for parties. You will also find reserved garage parking; cable television; recreation center; clubhouse with kitchen, massive stone fireplace and cedar walls; laundry in building; and elevator access to all floors. Buyer to verify all information before close of escrow. Turnkey and Nicely Updated Home in Top WestView High School District. Enter into the Living and Dining Room with Cathedral Ceilings and Lots of Light. Open and Bright - Beautiful Laminate Flooring compliments the Granite Kitchen Counters, Stainless Steel Appliances, and Designer Paint. Enjoy your NO maintenance yards - especially the large private backyard - perfect for enjoying time with family and entertaining. Top Rated Schools, Close to Shopping, Dining and the Freeway. Make This Your Home Today! Canyon View Elementary, Mesa Verde Elementary, and Westview High School are assigned to this home. Rare 3BR, top floor, west-facing beach condo with a gorgeous interior & great ocean views! Relax & get away from it all in the to-die for master retreat featuring walls of windows & large balcony to take advantage of the beautiful vistas. Upgraded w/Corinthian counter tops, designer cabinets, washer & dryer in condo, ceiling fans, 3 balconies. Lush tropical Maui-like landscape, waterfalls, streams, & Koi fish pond. Enjoy Olympic size heated pool & spa, gym, saunas, billiards, ping pong, & putting green. Additional upgrades include: recessed and track lighting, GE Profile cook top, Thermador double ovens, ceiling fans, designer paint, fireplace and built-in bookshelves in master retreat, and jetted tub in downstairs bath. Located between Oceanside Harbor and Oceanside Pier, North Coast Village is a tropical oasis on the Pacific Ocean. The complex consists of nine three-story buildings surrounded by 2-story cottages, on several acres of beautifully landscaped grounds. You are just steps from the sand; there are no roads to cross-this is an OCEANFRONT COMPLEX! Swim in the Olympic sized heated pool (one of two pools and spas), or enjoy a romantic walk on one of the most beautiful stretches of beach in Southern California. Experience spectacular sunsets and enjoy a relaxing dinner along the picturesque adjacent harbor which features several excellent restaurants, great live music, and fun and unique shopping. There are also kayak, boat, and paddle boat rentals, and fishing or whale watching excursions. At the end of the Oceanside Pier you'll find Ruby's, a fun family restaurant. North Coast Village offers billiards, ping pong, a fitness center with sauna, and a barbecue area overlooking the pool for parties. You will also find reserved garage parking; cable television; recreation center; clubhouse with kitchen, massive stone fireplace and cedar walls; laundry facilities. Buyer to verify all information before close of escrow. AMAZING 180° VIEWS of the OCEAN, RIVER, HARBOR, & MOUNTAINS from this corner 2 BR, 2 BA single-level cottage at North Coast Village. Beautifully remodeled with granite counters, cherry vanities, and a stone/tile open shower and glass bowl sink in the master bath, you'll find plantation shutters throughout, & a cozy fireplace with custom mantel & surround in the living room. Vinyl slider & windows, tile floors in kitchen, living room, & baths. Arched doorways, re-textured ceilings, mirrored closet doors. This incredible 180° view is to-die-for! The Pacific Ocean, jetty, marina, river, and mountains will captivate your senses. Enjoy unobstructed views to Catalina! The corner location adds 2 extra windows which let in additional natural light and create a more spacious feeling. Beautiful designer light fixtures are found throughout the condo. North Coast Village is located between the Oceanside Harbor and the Oceanside Pier, and is a favorite destination for people from around the world. The complex consists of nine three-story buildings surrounded by 2-story cottages, on several acres of beautifully landscaped grounds. You are just steps from the sand; there are no roads to cross-this is an OCEANFRONT COMPLEX! Swim in the Olympic sized heated pool (one of two pools and spas), or enjoy a romantic walk on one of the most beautiful stretches of beach in Southern California. Experience spectacular sunsets and enjoy a relaxing dinner along the picturesque adjacent harbor which features several excellent restaurants, great live music, and fun and unique shopping. There are also kayak, boat, and paddle boat rentals, and fishing or whale watching excursions. At the end of the Oceanside Pier you'll find Ruby's, a fun family restaurant. North Coast Village offers billiards, ping pong, a fitness center with sauna, and a barbecue area overlooking the pool for parties. You will also find reserved garage parking, cable television, a recreation center, clubhouse with kitchen, massive stone fireplace and cedar walls, as well as laundry facilities. The Mainstreet Oceanside Farmer's Market is a delightful experience near the Pier which takes place every Thursday from 9-1, and and the Sunset Market Thursday evenings from 5-9. Within a short drive, enjoy Disneyland, Knott's Berry Farm, Universal Studios, Legoland, Wild Animal Park, SeaWorld, San Diego Zoo, La Jolla, Del Mar Race Track, Sea Port Village, Catalina Island, Balboa Island, Hollywood, and Rodeo Drive Buyer to verify all information before close of escrow. Enjoy panoramic vistas of the ocean and harbor from inside this west-facing remodeled condo! From the balcony you can also see the pier. This coveted single-story corner unit includes 1040 square feet of living space and 2 parking spaces. The beautiful wood-look tile floors provide a casual beach look and are also very practical. Attractively furnished, upgrades include re-textured ceilings, 3 ceiling fans, designer paint, remodeled bathrooms with designer tile and a walk-in shower in the secondary bath. This coveted ocean-close location is rarely available! North Coast Village is located between the Oceanside Harbor and the Oceanside Pier, and is a favorite vacation destination for people from all over the world. The complex consists of nine three-story buildings on acres of beautifully landscaped grounds. You are just steps from the sand; there are no roads to cross-this is an OCEANFRONT COMPLEX! Swim in the Olympic size heated pool (one of two pools and spas), or enjoy a romantic walk on one of the most beautiful stretches of beach in Southern California. Stroll around the lush tropical grounds with streams, waterfalls, Koi ponds, and beautiful gardens. In the evening, gorgeous colored lights create a magical atmosphere. Experience spectacular sunsets and enjoy a relaxing dinner along the picturesque adjacent harbor which features several excellent restaurants, great live music, and fun and unique shopping. There are also kayak, boat, and paddle boat rentals, and fishing or whale watching excursions. At the end of the Oceanside Pier you'll find Ruby's, a fun family restaurant. North Coast Village offers billiards, ping pong, a fitness center with sauna, putting green, and a barbeque area overlooking the pool for parties. You will also find reserved garage parking; cable television; recreation center; clubhouse with kitchen, massive stone fireplace and cedar walls; laundry in building; and elevator access to all floors. The Mainstreet Oceanside Farmer's Market is a delightful experience near the Pier which takes place every Thursday from 9-1, and and the Sunset Market Thursday evenings from 5-9. Buyer to verify all information before close of escrow. Beautiful, west and north-facing, single story corner unit, 2 bedrooms/2 baths with INSIDE and balcony views of the ocean, Harbor, river, mountains and beach. It has been fabulously remodeled including features such as upgraded slab granite counter tops, custom toffee cabinets in the kitchen, living room, dining room, and baths. The decor is luxurious with an enticing blue and coral color scheme. Stone-look tile floors throughout the condo, granite fireplace, plantation shutters, enhance the ambience. North Coast Village offers billiards, ping pong, a fitness center with sauna, and a barbecue area overlooking the pool for parties. The complex consists of ten four-story buildings surrounded by 2-story cottages, on several acres of beautifully landscaped grounds with streams, waterfalls, and tropical gardens. You are just steps from the sand; there are no roads to cross-this is an OCEANFRONT COMPLEX! Swim in the large lagoon-style heated pool (one of two pools and spas), or enjoy a romantic walk on one of the most beautiful stretches of beach in Southern California. You will also find reserved garage parking, cable television, a recreation center, clubhouse with kitchen, massive stone fireplace and cedar walls, as well as laundry facilities. North Coast Village is located between the Oceanside Harbor and the Oceanside Pier, and is a favorite destination for people from around the world. This is a great area for riding bikes! A beautiful, scenic bike trail starts right across the street from the complex or bike along HISTORIC Pacific Coast Highway. Experience spectacular sunsets and enjoy a relaxing dinner along the picturesque adjacent harbor which features several excellent restaurants, great live music, and fun and unique shopping. There are also kayak, boat, and paddle boat rentals, and fishing or whale watching excursions. Downtown Oceanside is a neighborhood that knows its potential. With brand new renovations recently completed, new, exciting restaurants and hotels are opening all year! At the end of the Oceanside Pier you'll find Ruby's, a fun family restaurant. The Main Street Oceanside Farmer's Market is a delightful experience near the Pier which offers fresh produce every Thursday from 9-1, and the Sunset Market offering food booths from around the world and live music Thursday evenings from 5-9. Within a short drive, enjoy Disneyland, Knott's Berry Farm, Universal Studios, Legoland, Wild Animal Park, SeaWorld, San Diego Zoo, La Jolla, Balboa Park, the Gaslamp Distract and Del Mar Race Tracks. Craft beer capital of the US! Enjoy your favorites like Stone, Ballast Point and Green Flash or explore something new are creative at places like Masters in Oceanside! MOTIVATED SELLER - WILL CONSIDER ALL OFFERS! Seller already has a home under contract. It doesn't get any better than this! Only a few steps and your feet are in the sand! Experience stunning whitewater ocean views, sparkling sunsets, jetty, harbor, San Luis River, and mountain views from inside the condo and from your own balcony. Located ocean-close, this rarely available "E" condo is just a short walk to the Oceanside Harbor. Furnishings, accessories, and appliances included in sale of home. North Coast Village offers billiards, ping pong, a fitness center with sauna, and a barbecue area overlooking the pool for parties. The complex consists of ten four-story buildings surrounded by 2-story cottages, on several acres of beautifully landscaped grounds with streams, waterfalls, and tropical gardens. You are just steps from the sand; there are no roads to cross-this is an OCEANFRONT COMPLEX! Swim in the large lagoon-style heated pool (one of two pools and spas), or enjoy a romantic walk on one of the most beautiful stretches of beach in Southern California. You will also find reserved garage parking, cable television, a recreation center, clubhouse with kitchen, massive stone fireplace and cedar walls, as well as laundry facilities. North Coast Village is located between the Oceanside Harbor and the Oceanside Pier, and is a favorite destination for people from around the world. This is a great area for riding bikes! A beautiful, scenic bike trail starts right across the street from the complex or bike along HISTORIC Pacific Coast Highway. Experience spectacular sunsets and enjoy a relaxing dinner along the picturesque adjacent harbor which features several excellent restaurants, great live music, and fun and unique shopping. There are also kayak, boat, and paddle boat rentals, and fishing or whale watching excursions. Downtown Oceanside is a neighborhood that knows its potential. With brand new renovations recently completed, new, exciting restaurants and hotels are opening all year! At the end of the Oceanside Pier you'll find Ruby's, a fun family restaurant. The Main Street Oceanside Farmer's Market is a delightful experience near the Pier which offers fresh produce every Thursday from 9-1, and the Sunset Market offering food booths from around the world and live music Thursday evenings from 5-9. Within a short drive, enjoy Disneyland, Knott's Berry Farm, Universal Studios, Legoland, Wild Animal Park, SeaWorld, San Diego Zoo, La Jolla, Balboa Park, the Gaslamp Distract and Del Mar Race Tracks. Craft beer capital of the US! Enjoy your favorites like Stone, Ballast Point and Green Flash or explore something new are creative at places like Masters in Oceanside! Spacious single level home with lovely views & many upgrades in beautiful Lake San Marcos. 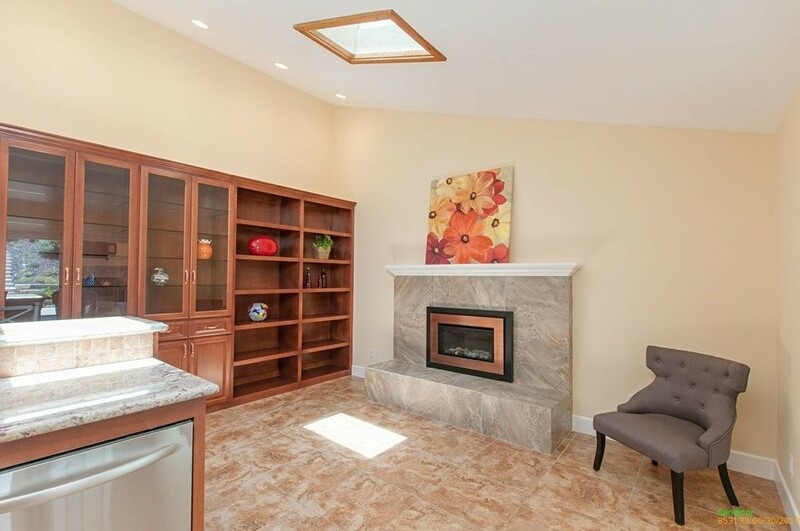 Open floor plan with vaulted ceiling & dual sided fireplace in living room/family room area. Stainless appliances - Bosch dishwasher, Maytag stove and microwave. The large hall bath features a jetted tub, granite counters, skylight, & separate shower. Shutters in secondary bedrooms, formal dining room w/wood blinds, view patio w/gazebo. The 19x11 enclosed patio is not included in s.f. Three-car split garages. San Marcos School District - Discovery Elementary, San Elijo Middle School, San Marcos High. Lake San Marcos has undergone a major transformation during the past few years! Millions of dollars have been invested in remodeling the Resort Hotel and facilities. The rebuilding of Quail's Inn is now in process. New docks have been installed throughout the lake and extensive improvements have been made to the landscape and environment of LSM. This location offers endless opportunities including boating, fishing golf, tennis, swimming, kayaking, etc. as well as the dozens of established clubs to join at the lake. Lake San Marcos offers a truly unique lifestyle! The current owner pays a $57/mo security fee that is optional. Buyer to verify all information before close of escrow. Enjoy views of the whitewater ocean, sand, harbor, and mountains from this luxury beach cottage. Home amenities include granite counters, custom cabinets, wine refrigerator, granite fireplace, and a walk-in shower with designer stone trim. The floor plan features an extra large living room with lots of glass to highlight the wonderful views. This home conveys fully furnished (!!) with a sofa bed plus a leather sofa, chair, and ottoman. The bedroom boasts a new pillow-top king-size bed with luxury linens. North Coast Village offers billiards, ping pong, a fitness center with sauna, and a barbecue area overlooking the pool for parties. The complex consists of ten four-story buildings surrounded by 2-story cottages, on several acres of beautifully landscaped grounds with streams, waterfalls, and tropical gardens. You are just steps from the sand; there are no roads to cross-this is an OCEANFRONT COMPLEX! Swim in the large lagoon-style heated pool (one of two pools and spas), or enjoy a romantic walk on one of the most beautiful stretches of beach in Southern California. You will also find reserved garage parking, cable television, a recreation center, clubhouse with kitchen, massive stone fireplace and cedar walls, as well as laundry facilities. North Coast Village is located between the Oceanside Harbor and the Oceanside Pier, and is a favorite destination for people from around the world. This is a great area for riding bikes! A beautiful, scenic bike trail starts right across the street from the complex or bike along HISTORIC Pacific Coast Highway. Experience spectacular sunsets and enjoy a relaxing dinner along the picturesque adjacent harbor which features several excellent restaurants, great live music, and fun and unique shopping. There are also kayak, boat, and paddle boat rentals, and fishing or whale watching excursions. Downtown Oceanside is a neighborhood that knows its potential. With brand new renovations recently completed, new, exciting restaurants and hotels are opening all year! At the end of the Oceanside Pier you'll find Ruby's, a fun family restaurant. The Main Street Oceanside Farmer's Market is a delightful experience near the Pier which offers fresh produce every Thursday from 9-1, and the Sunset Market offering food booths from around the world and live music Thursday evenings from 5-9. Within a short drive, enjoy Disneyland, Knott's Berry Farm, Universal Studios, Legoland, Wild Animal Park, SeaWorld, San Diego Zoo, La Jolla, Balboa Park, the Gaslamp Distract and Del Mar Race Tracks. Craft beer capital of the US! Enjoy your favorites like Stone, Ballast Point and Green Flash or explore something new are creative at places like Masters in Oceanside! 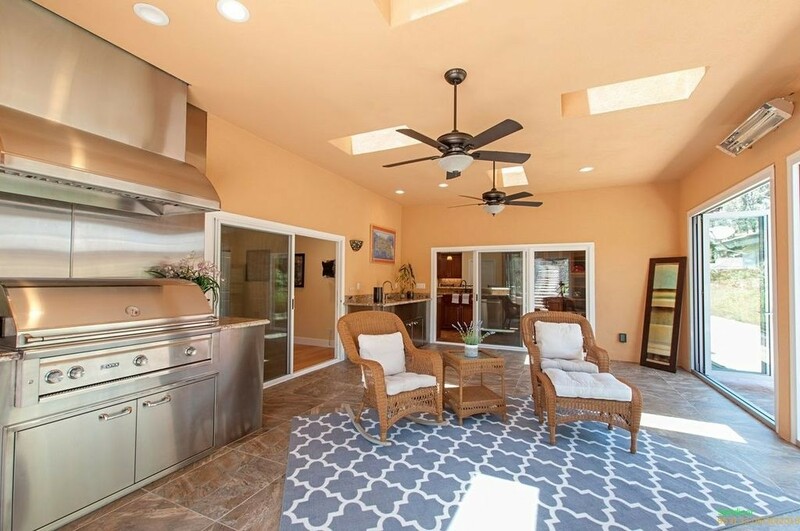 Beautifully Updated Large Family Home in Escondido. Big & Bright - you will be bathed in light through all the windows in this home. 4 Bedrooms, 3 Bedrooms, 2,700 sq ft - One Bedroom and One Bathroom are on the main floor. The oversized kitchen is nicely updated with granite counters & 5 burner gas range - your inner chef will be pleased. The back yard has a custom BBQ area, water fountain, and fire pit. The Family Room also has a fireplace. Highly desired Sonata neighborhood in South Escondido. Savor sweeping ocean, harbor, and mountain views from this delightful one-story, 2BR beach condo. Relax in the peaceful setting, beautifully furnished with a La-Z-Boy memory foam queen-size sleeper sofa, comfortable recliner, and 2 leather chairs in the large living room. The master bedroom has a king-size bed and great views. Fully equipped kitchen, 3 flat-screen TVs and DVD players. Enjoy 2 year-round heated pools, spas, gym, saunas, gorgeous tropical grounds, waterfalls, and streams. Sold furnished! Experience great views even from INSIDE this beautiful condo! The spacious floor plan allows relaxed and easy living. You'll love the cozy fireplace, upgraded counter tops, tile, and carpet, and three ceiling fans. Located between Oceanside Harbor and Oceanside Pier, North Coast Village is a tropical oasis on the Pacific Ocean. The complex consists of nine four-story buildings surrounded by 2-story cottages on several acres of beautifully landscaped grounds. You are just steps from the sand. Swim in the Olympic-size heated pool (one of two pools and spas), or enjoy a romantic walk on one of the most beautiful stretches of beach in Southern California. Experience spectacular sunsets and enjoy a relaxing dinner along the picturesque adjacent harbor which features several excellent restaurants, great live music, and fun and unique shopping. There are also kayak, boat, and paddle boat rentals, as well as fishing or whale watching excursions. At the end of the Oceanside Pier you'll find Ruby's, a fun family restaurant. North Coast Village offers billiards, ping pong, a fitness center with sauna, and a barbecue area overlooking the pool for parties. You will also find reserved garage parking; cable television; recreation center; clubhouse with kitchen, massive stone fireplace and cedar walls; and laundry facilities. Buyer to verify all information before close of escrow. Accepting back-up offers. Enjoy panoramic, forever views to the ocean, mountains, and Coronado, from this gorgeous end unit in Del Cerro. Upgrades to kitchen include new quartz counters, white Shaker cabinetry & tile back splash. New laminate wood floors in living & dining rooms, sophisticated ledger stone fireplace, new windows & fresh paint. Gated community features, tennis, pool, gym/sauna, play structure. Minutes to SDSU & Mission Valley. Built as 3 BR easily conv. back. Floor-to-ceiling windows and panoramic views off the balcony greet you from the moment you walk in! Updates include new laminate wood floors in the living and dining rooms, sophisticated ledger stone fireplace, soaring ceilings, and fresh paint. Upgrades to the generous kitchen include new quartz counters, white Shaker cabinetry, stunning tile backsplash, and tile floors. The spacious master suite boasts a secondary view balcony, ensuite bathroom, and the ownership rights to extend out further. Both bedrooms feature new carpet and new paint. With an attached 2-car garage with epoxy flooring, this unit is a really special find for those who want the sophistication of a downtown condo without sacrificing the comforts of life in a small community! Built as a 3 bedroom, this 2 bed unit can easily be converted back. Enjoy panoramic, forever views to the ocean, mountains, and Coronado from this gorgeous townhome in Del Cerro! 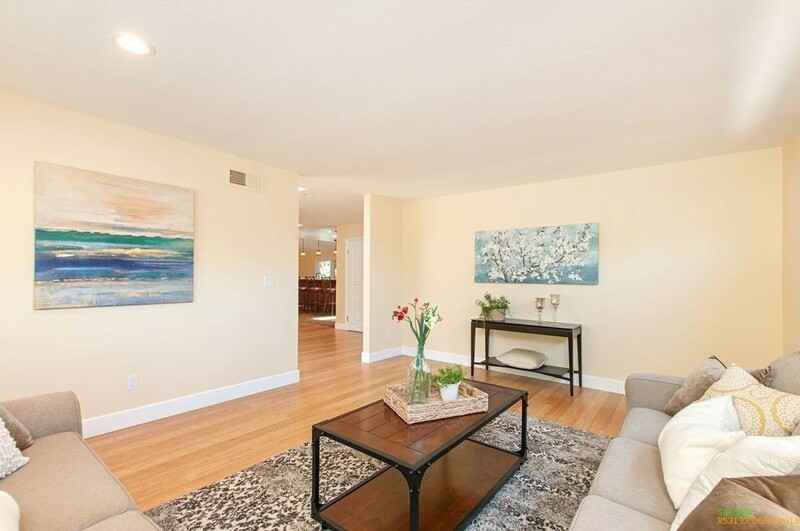 Located minutes to SDSU, Mission Valley and downtown, this move-in ready unit in the gated community of Del Cerro Heights features an abundance of upgrades and lives like a downtown highrise. Beautifully upgraded cul-de-sac home in desirable Chaparral Creek. Inside you'll find a bright, open-concept floor plan, first-floor master suite with walk-in closet, new white quartz kitchen counters, breakfast bar, stainless steel appliances, new premium carpet, wood shutters, and recessed lighting throughout. Outside you’ll find fruit trees and plenty of space to play or entertain. With NO HOA or Mello Roos, modern upgrades, and convenient location close to all, this is the perfect place to call home! FANTASTIC OPPORTUNITY to own PANORAMIC OCEAN & PIER VIEW luxury penthouse condo with incredible rental history! Impeccably remodeled with KraftMaid distressed cherry cabinets, travertine floors & baths, slab granite counters throughout. One-of-a kind 400+ sf privatized Master Retreat with extra-large wrap-around balcony featuring ocean, beach & pier views! Luxuriously furnished w/custom-made sofa & club chairs. Enjoy 2 heated pools, spa, saunas, gym, putting green, waterfalls, streams, Koi ponds, BBQ's. THE JEWEL OF NORTH COAST VILLAGE! This $150,000 exquisite remodel is Tommy Bahama's personal beach get-away on the Pacific! It features a large wrap-around balcony surrounding the 400+ sf master retreat with breathtaking ocean views to the west, and ocean and pier views to the south. The to-die-for kitchen has Kraftmaid distressed cherry cabinets, gorgeous granite counter tops, stainless steel appliances, travertine stone flooring, and is fully equipped. The cozy yet elegant living area with stone fireplace also has its own private balcony, overlooking the tropical gardens of North Coast Village with waterfalls, fountains, streams, BBQ areas, plus 2 heated pools and spas. The living room is furnished with exquisite custom pieces that combine to create an relaxed, comfortable atmosphere. The completely private, luxurious master retreat features a sitting area with two leather Barcalounger swivel/rocker recliners, enabling you to enjoy sailboats and surfers on the ocean, a romantic sunset, or turn and watch one of three LCD televisions in the condo. 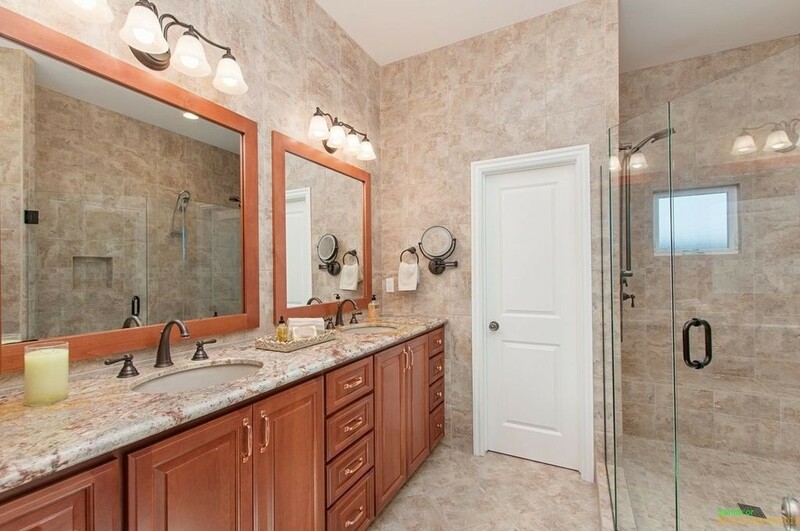 Both the master bath and secondary baths (with walk-in shower) feature travertine stone, slab granite counters, and Kraftmaid distressed cherry cabinets. You will also find workout rooms, saunas, billiards, and ping pong. Located just south of Oceanside Harbor and north of Oceanside Pier, North Coast Village is a comfortable drive from Disneyland, Knott's Berry Farm, Six Flags, Wild Animal Park, Legoland, Sea World, and downtown San Diego. Please see the beautiful virtual tour! Buyer to verify all information before close of escrow. Sold prior to MLS entry. As you walk through the staffed secure gate to North Coast Village you are transported to a tropical oasis reminiscent of the Costa Rican Rain Forest. Running streams, waterfalls, lush foliage, and Koi make their way through the spacious grounds of this resort-like beachfront condominium complex in Oceanside California. You will notice the crystal clear heated pool and spa, gleaming barbecues, convenient picnic tables, sand rinsing stations to remove the lingering beach. If you need a break from sun and surf, you might enjoy a game of pool on one of North Coast Village's 2 new pool tables, a jog on a treadmill in the exercise room, a little ping pong, or a sauna. Feeding our giant Koi is a simple pleasure not to be missed during your Oceanside visit. When you venture all the way through the back gates, you find yourself on one of North San Diego County’s finest beaches: broad and flat, with fire rings, volleyball, and great surf breaks - right out back! Be sure to stake out a fire ring (to the left) for a unique evening beach fire at least one night while you are in Oceanside. To your right, you can walk or bike to Oceanside’s busy little harbor for a bite to eat or some boating, and to your left you can venture down the strand to southern California’s longest pier for some fishing (no license needed) or casual dining at Ruby's. North Coast Village is close enough to walk to everything near the beach, so your car can stay in its secure underground parking spot - especially useful when beach parking becomes a premium in the summer. The Mainstreet Oceanside Farmer's Market is a delightful experience near the Pier which takes place every Thursday from 9-1, and and the Sunset Market Thursday evenings from 5-9. Within a short drive, visit Disneyland & California Adventure, Knott's Berry Farm, Universal Studios, Magic Mountain, Balboa Island, La Jolla, Mission San Juan Capistrano, Mission Luis Rey, Queen Mary, San Diego State Parks, San Diego Wild Animal Park, Legoland, Sea World, The Flower Fields of Carlsbad, Temecula Wine Country, San Diego Zoo, Del Mar Racetrack, Coronado Island, Oceanside Harbor, Birch Aquarium at Scripp's Institute of Oceanography, and Palomar Observatory. Upgrades galore in this stunning, contemporary beach cottage that is sure to amaze. Travertine stone floors, granite floor-to-ceiling fireplace, plantation shutters, crown molding, exquisite furnishings. Slab granite kitchen with glass tile backsplash, cherry cabinets, and stainless appliances. The bath has a gorgeous ledge stone wall and glass bowl sink. Ocean views from the patio. SOLD COMPLETELY FURNISHED! This inviting and upscale condo is a welcome retreat after a day in the surf and sun! Enjoy deluxe furnishings from name brand retailers such as Lexington, Arizona leather, and Tommy Bahama. Additional upgrades include indirect lighting throughout living room, kitchen, and hallway, designer light fixtures, new vinyl windows and sliding door, skip troweled ceiling and walls with bull-nosed corners, custom soft-close cabinetry, under-counter lighting, and gorgeous travertine floor with granite edging. North Coast Village offers billiards, ping pong, a fitness center with sauna, and a barbecue area overlooking the pool for parties. The complex consists of ten four-story buildings surrounded by 2-story cottages, on several acres of beautifully landscaped grounds with streams, waterfalls, and tropical gardens. You are just steps from the sand - this is an OCEANFRONT COMPLEX! The A Building has its own heated pool, spa, barbecues, and laundry facilities. Enjoy a romantic walk on one of the most beautiful stretches of beach in Southern California. You will also find reserved garage parking, cable television, a recreation center, clubhouse with kitchen, massive stone fireplace and cedar walls, as well as laundry facilities. North Coast Village is located between the Oceanside Harbor and the Oceanside Pier, and is a favorite destination for people from around the world. This is a great area for riding bikes! A beautiful, scenic bike trail starts right across the street from the complex or bike along HISTORIC Pacific Coast Highway. Experience spectacular sunsets and enjoy a relaxing dinner along the picturesque adjacent harbor which features several excellent restaurants, great live music, and fun and unique shopping. There are also kayak, boat, and paddle boat rentals, and fishing or whale watching excursions. Downtown Oceanside is a neighborhood that knows its potential. With brand new renovations recently completed, new, exciting restaurants and hotels are opening all year! At the end of the Oceanside Pier you'll find Ruby's, a fun family restaurant. The Main Street Oceanside Farmer's Market is a delightful experience near the Pier which offers fresh produce every Thursday from 9-1, and the Sunset Market offering food booths from around the world and live music Thursday evenings from 5-9. Within a short drive, enjoy Disneyland, Knott's Berry Farm, Universal Studios, Legoland, Wild Animal Park, SeaWorld, San Diego Zoo, La Jolla, Balboa Park, the Gaslamp Distract and Del Mar Race Tracks. Craft beer capital of the US! Enjoy your favorites like Stone, Ballast Point and Green Flash. Bring your surfboards! This sought-after, end-unit cottage has some of the easiest beach access at North Coast Village! Enjoy the ocean view from your walk-out patio - just steps from the sand and surf. The spacious kitchen features slab granite counter tops, and the corner location is drenched with sunlight from the extra windows. Great potential as a vacation rental. Reserved parking in garage. The A Building has its own pool, spa, laundry, and barbecues, and has just been beautifully re-landscaped! North Coast Village offers billiards, ping pong, a fitness center with sauna, and a barbecue area overlooking the pool for parties. The complex consists of ten four-story buildings surrounded by 2-story cottages, on several acres of beautifully landscaped grounds with streams, waterfalls, and tropical gardens. You are just steps from the sand; there are no roads to cross-this is an OCEANFRONT COMPLEX! Swim in the large lagoon-style heated pool (one of two pools and spas), or enjoy a romantic walk on one of the most beautiful stretches of beach in Southern California. You will also find reserved garage parking, cable television, a recreation center, clubhouse with kitchen, massive stone fireplace and cedar walls, as well as laundry facilities. North Coast Village is located between the Oceanside Harbor and the Oceanside Pier, and is a favorite destination for people from around the world. This is a great area for riding bikes! A beautiful, scenic bike trail starts right across the street from the complex or bike along HISTORIC Pacific Coast Highway. Experience spectacular sunsets and enjoy a relaxing dinner along the picturesque adjacent harbor which features several excellent restaurants, great live music, and fun and unique shopping. There are also kayak, boat, and paddle boat rentals, and fishing or whale watching excursions. Downtown Oceanside is a neighborhood that knows its potential. With brand new renovations recently completed, new, exciting restaurants and hotels are opening all year! At the end of the Oceanside Pier you'll find Ruby's, a fun family restaurant. The Main Street Oceanside Farmer's Market is a delightful experience near the Pier which offers fresh produce every Thursday from 9-1, and the Sunset Market offering food booths from around the world and live music Thursday evenings from 5-9. Within a short drive, enjoy Disneyland, Knott's Berry Farm, Universal Studios, Legoland, Wild Animal Park, SeaWorld, San Diego Zoo, La Jolla, Balboa Park, the Gaslamp Distract and Del Mar Race Tracks. Craft beer capital of the US! Enjoy your favorites like Stone, Ballast Point and Green Flash or explore something new are creative at places like Masters in Oceanside! All information provided in this listing is should be verified by buyer's agent or buyers prior to final contingency removal. KW Commercial is proud to present 625 N Santa Fe. Currently three vacant structures including a residence and two retail buildings, this property represents an opportunity to develop 17,206 SF of mixed-use zoned land. The zoning is M-U (40), which allows for up to 40 units per acre. This is a Prime Development Opportunity! DON"T MISS OUT!!! !!! See Supplemental Remarks !!! KW Commercial is proud to present 625 N Santa Fe. Currently three vacant structures including a residence and two retail buildings, this property represents an opportunity to develop 17,206 SF of mixed-use zoned land. The zoning is M-U (40), which allows for up to 40 units per acre. There is an extensive list of permitted uses available through the City of Vista’s planning department website. Some of those uses include, but are not limited to, multi-family dwellings, single-family dwellings, offices (non-medical), business support services, retail sales (general), restaurant (excluding drive through), and medical cannabis dispensary. The property also falls under an overlay zone which loosens development restrictions even further by lowering several requirements such as parking density, set backs and more. More information about the overlay can be delivered on request. 625 N Santa Fe is located only 1 mile away from HWY-78 and is a central property to a still emerging market. This meticulously maintained 4 beds + large loft, 3 ½ bath home is perfect for a growing family! Features include tile flooring on the main level & large kitchen with SS appliances, granite counters & backsplash, & a large kitchen island. 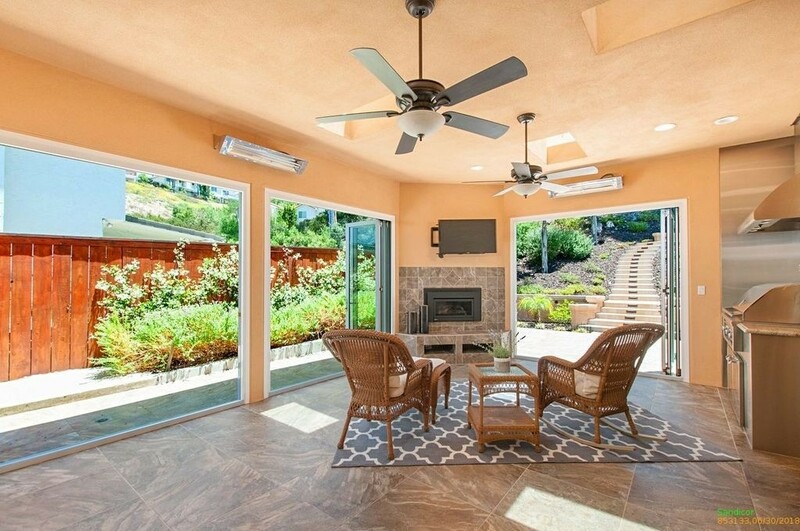 Family room opens to entertainer’s backyard with brick pavers, a built-in-bbq, & fire pit. Attached 2-car garage with epoxy floor & built-in ceiling shelves. HOA membership gives access to community pool, workout room, tennis courts & more. Close to first class schools! Built in 2014, this home has been meticulously maintained inside & out! Gorgeous kitchen features white cabinetry, stainless steel appliances, granite counters & backsplash, & a large island with room for bar seating. Expansive loft with full bath that can be used for lounging, an office, an additional playroom & easily can be converted into fifth bedroom. Additional home features include plantation shutters & an oversized laundry room. This spacious home has been well taken care of and is ready for new owners! Association features: Large Clubhouse, resort-style swimming pool with beach entry and swimming lanes, a children's wading pool, lounge areas, spa, state-of-the-art fitness room, a multi-purpose club room, full kitchen, fire pit, turf bocce ball courts, gas BBQ stations, and covered outdoor dining areas. Great location with high performing schools, beautiful parks, walking trails, easy freeway access and only minutes to Downtown San Diego, International Border & beaches. TWO PARKING SPACES included in this ocean close highly desirable "E" building. Views to the Oceanside Pier and beyond from the moment you enter. Enjoy this beautiful home with ocean, sand, and garden views. The south-facing orientation of the unit ensures a lot of sunshine year-round with views that extend to the Oceanside pier and, with this location in the tower building closest the beach, places this prime vacation rental opportunity close enough to catch the sounds and sunsets of the ocean. North Coast Village offers billiards, ping pong, a fitness center with sauna, and a barbecue area overlooking the pool for parties. The complex consists of ten four-story buildings surrounded by 2-story cottages, on several acres of beautifully landscaped grounds with streams, waterfalls, and tropical gardens. You are just steps from the sand; there are no roads to cross-this is an OCEANFRONT COMPLEX! Swim in the large lagoon-style heated pool (one of two pools and spas), or enjoy a romantic walk on one of the most beautiful stretches of beach in Southern California. You will also find reserved garage parking, cable television, a recreation center, clubhouse with kitchen, massive stone fireplace and cedar walls, as well as laundry facilities. North Coast Village is located between the Oceanside Harbor and the Oceanside Pier, and is a favorite destination for people from around the world. This is a great area for riding bikes! A beautiful, scenic bike trail starts right across the street from the complex or bike along HISTORIC Pacific Coast Highway. Experience spectacular sunsets and enjoy a relaxing dinner along the picturesque adjacent harbor which features several excellent restaurants, great live music, and fun and unique shopping. There are also kayak, boat, and paddle boat rentals, and fishing or whale watching excursions. Downtown Oceanside is a neighborhood that knows its potential. With brand new renovations recently completed, new, exciting restaurants and hotels are opening all year! At the end of the Oceanside Pier you'll find Ruby's, a fun family restaurant. The Main Street Oceanside Farmer's Market is a delightful experience near the Pier which offers fresh produce every Thursday from 9-1, and the Sunset Market offering food booths from around the world and live music Thursday evenings from 5-9. Within a short drive, enjoy Disneyland, Knott's Berry Farm, Universal Studios, Legoland, Wild Animal Park, SeaWorld, San Diego Zoo, La Jolla, Balboa Park, the Gaslamp Distract and Del Mar Race Tracks. Craft beer capital of the US! Enjoy your favorites like Stone, Ballast Point and Green Flash or explore something new are creative at places like Masters in Oceanside! This rare find has 3 balconies! Panoramic ocean views abound from this 2BR "reverse loft" in North Coast Village. In addition to the living room balcony, this unique condo features 2 expansive balconies off the master retreat! The upstairs corner location affords an extra ocean-view window in the master bedroom. There are ceiling fans in the dining area & master bedroom, and mirrored closet doors in both bathrooms. The A Building has its own pool, spa, BBQ's, ping pong, & laundry. 24-hr security guards. This is a very unique setting, because there are balconies with views that are west, south, and north facing. North Coast Village is an oceanfront tropical oasis located between the Oceanside Harbor and the Oceanside Pier, and is a favorite destination for people from around the world. The complex consists of ten three-story buildings surrounded by 2-story cottages, on several acres of beautifully landscaped grounds. You are just steps from the sand! You have access to 2 pools and spas, as well as one of the most beautiful stretches of beach in Southern California. Experience spectacular sunsets and enjoy a relaxing dinner along the picturesque adjacent harbor which features several excellent restaurants, great live music, and fun and unique shopping. There are also kayak, boat, and paddle boat rentals, and fishing or whale watching excursions. At the end of the Oceanside Pier you'll find Ruby's, a fun family restaurant. The MainStreet Oceanside Farmer's Market is a delightful experience near the Pier which takes place every Thursday from 9-1, and and the Sunset Market Thursday evenings from 5-9. North Coast Village offers billiards, ping pong, a fitness center with sauna, and a barbecue area overlooking the pool for parties. You will also find reserved garage parking, cable television, a recreation center, clubhouse with kitchen, massive stone fireplace and cedar walls, as well as laundry facilities. Within a short drive, enjoy Disneyland, Knott's Berry Farm, Universal Studios, LegoLand, Wild Animal Park, SeaWorld, San Diego Zoo, La Jolla, Del Mar Race Track, Sea Port Village, Catalina Island, Balboa Island, Hollywood, and Rodeo Drive. As you walk through the staffed secure gate to North Coast Village you are transported to a tropical paradise reminiscent of the Costa Rican Rain Forest. Running streams, waterfalls, lush foliage, and Koi meander through the spacious grounds of this resort-like beachfront condominium complex in Oceanside California. You will notice the crystal clear heated pool and spa, gleaming barbecues, convenient picnic tables, sand rinsing stations to remove the lingering beach. If you need a break from sun and surf, you might enjoy a game of pool on one of North Coast Village's 2 new pool tables, a jog on a treadmill in the exercise room, a little ping pong, or a sauna. Feeding our giant Koi is a simple pleasure not to be missed during your Oceanside visit. When you venture all the way through the back gates, you find yourself on one of North San Diego County’s finest beaches: broad and flat, with fire rings, volleyball, and great surf breaks - right out back! Be sure to stake out a fire ring for a unique and relaxing evening. Buyer to verify all information before close of escrow. This cozy beach condo is a great choice if you're looking for a 2 bedroom, 2 bath condo on one floor with all the amenities of oceanfront North Coast Village at a great price! Sold furnished with a sofa, love seat, and two chairs, Hula Hideaway features wood floors, a spacious living room and dining room, and a balcony overlooking lovely greenery. Wander around the gorgeous tropical grounds with waterfalls, streams, heated pools & spas, and putting green. Enjoy exercise facilities, saunas, 24-hr security. North Coast Village is an oceanfront tropical paradise located right on the beach between the Oceanside Harbor and the Oceanside Pier, and is a favorite destination for people from around the world. You'll enjoy the beautiful waterfalls, tropical foliage, flowers, streams, walkways, Koi ponds, two heated pools and spas, putting green, exercise rooms, saunas, and recreation rooms with table tennis, billiards and foosball. The complex consists of nine three-story buildings surrounded by 2-story cottages, on several acres of lushly landscaped tropical grounds. You are just steps from the sand; there are no roads to cross - this is an OCEANFRONT COMPLEX! Swim in the heated pool (one of two pools and spas), or enjoy a romantic walk on the beach. North Coast Village offers billiards, table tennis, a fitness center with sauna, and a barbecue area overlooking the pool. You will also find reserved garage parking, cable television, a recreation center, a clubhouse with kitchen, massive stone fireplace and cedar walls, as well as laundry facilities in the building. Experience spectacular sunsets and enjoy a relaxing dinner along the picturesque adjacent harbor which features several excellent restaurants, great live music, and unique shopping. There are also kayak, boat, and paddle boat rentals, and fishing or whale watching excursions. There is a great bike trail across the street from NCV. At the end of the Oceanside Pier you'll find Ruby's, a fun family restaurant. The Mainstreet Oceanside Farmer's Market near the pier is a delightful experience which takes place every Thursday from 9-1, and the exciting Sunset Market Thursday evenings from 5-9. Within a short drive, visit Disneyland & California Adventure, Knott's Berry Farm, Universal Studios, Magic Mountain, Balboa Island, La Jolla, Mission San Juan Capistrano, Mission Luis Rey, Queen Mary, San Diego State Parks, San Diego Wild Animal Park, Legoland, Sea World, The Flower Fields of Carlsbad, Temecula Wine Country, San Diego Zoo, Del Mar Racetrack, Coronado Island, Oceanside Harbor, Birch Aquarium at Scripp's Institute of Oceanography, and Palomar Observatory. Set amongst the lush, Maui-like tropical landscaping of North Coast Village, fantastic, whitewater ocean, sand, harbor views await to greet you each time you come through the door. You will find beautiful tile flooring in the kitchen and bathroom. The bathroom and kitchen have been upgraded with slab granite countertops and a matching backsplash. Enjoy the gorgeous tropical gardens, waking paths, streams, waterfalls, heated pools & spas as you meander around this oceanfront complex. North Coast Village offers billiards, ping pong, a fitness center with sauna, and a barbecue area overlooking the pool for parties. The complex consists of ten four-story buildings surrounded by 2-story cottages, on several acres of beautifully landscaped grounds with streams, waterfalls, and tropical gardens. You are just steps from the sand; there are no roads to cross-this is an OCEANFRONT COMPLEX! Swim in the large lagoon-style heated pool (one of two pools and spas), or enjoy a romantic walk on one of the most beautiful stretches of beach in Southern California. You will also find reserved garage parking, cable television, a recreation center, clubhouse with kitchen, massive stone fireplace and cedar walls, as well as laundry facilities. North Coast Village is located between the Oceanside Harbor and the Oceanside Pier, and is a favorite destination for people from around the world. This is a great area for riding bikes! A beautiful, scenic bike trail starts right across the street from the complex or bike along HISTORIC Pacific Coast Highway. Experience spectacular sunsets and enjoy a relaxing dinner along the picturesque adjacent harbor which features several excellent restaurants, great live music, and fun and unique shopping. There are also kayak, boat, and paddle boat rentals, and fishing or whale watching excursions. Downtown Oceanside is a neighborhood that knows its potential. With brand new renovations recently completed, new, exciting restaurants and hotels are opening all year! At the end of the Oceanside Pier you'll find Ruby's, a fun family restaurant. The Main Street Oceanside Farmer's Market is a delightful experience near the Pier which offers fresh produce every Thursday from 9-1, and the Sunset Market offering food booths from around the world and live music Thursday evenings from 5-9. Within a short drive, enjoy Disneyland, Knott's Berry Farm, Universal Studios, Legoland, Wild Animal Park, SeaWorld, San Diego Zoo, La Jolla, Balboa Park, the Gaslamp Distract and Del Mar Race Tracks. Craft beer capital of the US! Enjoy your favorites like Stone, Ballast Point and Green Flash or explore something new are creative at places like Masters in Oceanside! Welcome Home to this rare luxury, urban loft designed by noted contemporary architect Jonathan Segal in the heart of the Marina! Dramatic floor-to-ceiling windows serve as the backdrop of this 2-story unit with 17-foot ceilings, fresh paint throughout & SS appliances. Entry level bedroom with his & her closets and full bathroom downstairs. Spiral staircase leads to the upstairs Master Suite ft. dual closets & additional walk in closet & bathroom. Beautiful patio great for entertaining friends & family! Open the patio doors and you’ll hear the sound of the waves while watching the sailboats and surfers in the sea. Stunning, rarely available western and southwestern ocean and pier views abound your next beach home. Upgraded with stainless steel appliances, cabinetry, and tumbled stone/granite countertops in the kitchen, a modern, electric fireplace to warm the living room, and matching upgraded counters and cabinets in the bath, nearly every inch of this home provides an exquisite ocean view. North Coast Village offers billiards, ping pong, a fitness center with sauna, and a barbecue area overlooking the pool for parties. The complex consists of ten four-story buildings surrounded by 2-story cottages, on several acres of beautifully landscaped grounds with streams, waterfalls, and tropical gardens. You are just steps from the sand; there are no roads to cross-this is an OCEANFRONT COMPLEX! Swim in the large lagoon-style heated pool (one of two pools and spas), or enjoy a romantic walk on one of the most beautiful stretches of beach in Southern California. You will also find reserved garage parking, cable television, a recreation center, clubhouse with kitchen, massive stone fireplace and cedar walls, as well as laundry facilities. North Coast Village is located between the Oceanside Harbor and the Oceanside Pier, and is a favorite destination for people from around the world. This is a great area for riding bikes! A beautiful, scenic bike trail starts right across the street from the complex or bike along HISTORIC Pacific Coast Highway. Experience spectacular sunsets and enjoy a relaxing dinner along the picturesque adjacent harbor which features several excellent restaurants, great live music, and fun and unique shopping. There are also kayak, boat, and paddle boat rentals, and fishing or whale watching excursions. Downtown Oceanside is a neighborhood that knows its potential. With brand new renovations recently completed, new, exciting restaurants and hotels are opening all year! At the end of the Oceanside Pier you'll find Ruby's, a fun family restaurant. The Main Street Oceanside Farmer's Market is a delightful experience near the Pier which offers fresh produce every Thursday from 9-1, and the Sunset Market offering food booths from around the world and live music Thursday evenings from 5-9. Within a short drive, enjoy Disneyland, Knott's Berry Farm, Universal Studios, Legoland, Wild Animal Park, SeaWorld, San Diego Zoo, La Jolla, Balboa Park, the Gaslamp Distract and Del Mar Race Tracks. Craft beer capital of the US! Enjoy your favorites like Stone, Ballast Point and Green Flash or explore something new are creative at places like Masters in Oceanside! Sold before input to MLS Buyer to verify all information before close of escrow. DIRECT WEST-FACING CONDO WITH FABULOUS OCEAN VIEWS!! This is one of the premium condos in North Coast Village, with a great ocean view from the moment you walk in the door! Excellent vacation rental with great rental history. The home is completely furnished with exquisite decor and has been beautifully refurbished. 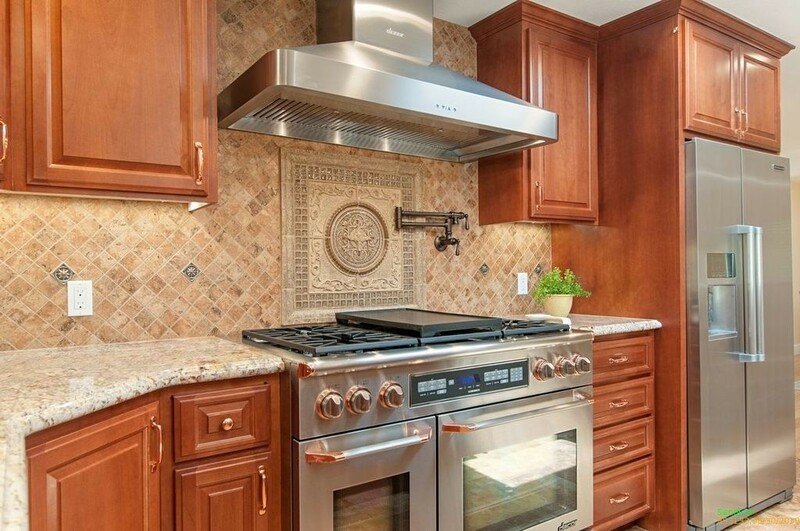 The kitchen is lined with tumbled stone travertine countertops and backsplash paired with stainless steel appliances. North Coast Village is located along the mile-long stretch of beach between Oceanside Harbor and the Oceanside Pier and is a favorite destination for couples and families from all over the world. The complex consists of ten three-story buildings surrounded by 2-story cottages, on several acres of beautifully landscaped grounds. The units are rentable by the week or even by the day. You are just steps from the sand; there are no roads to cross-this is an OCEANFRONT COMPLEX! North Coast Village offers billiards, ping pong, a fitness center with sauna, and a barbecue area overlooking the pool for parties. This is a great area for riding bikes! A beautiful, scenic bike trail starts right across the street from the complex or bike along HISTORIC Pacific Coast Highway. Experience spectacular sunsets and enjoy a relaxing dinner along the picturesque adjacent Harbor which features several excellent restaurants, great live music, and fun and unique shopping. There are also kayak, boat, and paddle boat rentals, and fishing or whale watching excursions. Downtown Oceanside is a neighborhood that knows its potential. This ocean view condo can be your own beach get-away! Located in the ocean-close D Building, you'll enjoy all the amenities that North Coast Village has to offer: 2 heated pools and spas, gorgeous tropical grounds with waterfalls, streams, and Koi pond, exercise facilities, putting green, BBQ's, and 24-hr guarded, gated security. Mirrored wall in living room, newer sliding door and window. NCV is located between the Oceanside Harbor and Oceanside Pier. North Coast Village offers billiards, ping pong, a fitness center with sauna, and a barbecue area overlooking the pool for parties. The complex consists of ten four-story buildings surrounded by 2-story cottages, on several acres of beautifully landscaped grounds with streams, waterfalls, and tropical gardens. You are just steps from the sand; there are no roads to cross-this is an OCEANFRONT COMPLEX! Swim in the large lagoon-style heated pool (one of two pools and spas), or enjoy a romantic walk on one of the most beautiful stretches of beach in Southern California. You will also find reserved garage parking, cable television, a recreation center, clubhouse with kitchen, massive stone fireplace and cedar walls, as well as laundry facilities. North Coast Village is located between the Oceanside Harbor and the Oceanside Pier, and is a favorite destination for people from around the world. This is a great area for riding bikes! A beautiful, scenic bike trail starts right across the street from the complex or bike along HISTORIC Pacific Coast Highway. Experience spectacular sunsets and enjoy a relaxing dinner along the picturesque adjacent harbor which features several excellent restaurants, great live music, and fun and unique shopping. There are also kayak, boat, and paddle boat rentals, and fishing or whale watching excursions. Downtown Oceanside is a neighborhood that knows its potential. With brand new renovations recently completed, new, exciting restaurants and hotels are opening all year! At the end of the Oceanside Pier you'll find Ruby's, a fun family restaurant. The Main Street Oceanside Farmer's Market is a delightful experience near the Pier which offers fresh produce every Thursday from 9-1, and the Sunset Market offering food booths from around the world and live music Thursday evenings from 5-9. Within a short drive, enjoy Disneyland, Knott's Berry Farm, Universal Studios, Legoland, Wild Animal Park, SeaWorld, San Diego Zoo, La Jolla, Balboa Park, the Gaslamp Distract and Del Mar Race Tracks. Craft beer capital of the US! Enjoy your favorites like Stone, Ballast Point and Green Flash or explore something new are creative at places like Masters in Oceanside! Sales price included buyers allowing sellers to continue living in the home after COE for 4 months at no additional cost. This is approximately a $12,000 additional acquisition cost. Sold before input to MLS. Set amongst the lush, Maui-like tropical landscaping of North Coast Village, fantastic, whitewater ocean, sand, harbor views await to greet you each time you come through the door. You will find beautiful tile flooring in the kitchen, bathroom and on the balcony. The bathroom and kitchen have been upgraded with slab granite countertops and a matching backsplash. Enjoy the gorgeous tropical gardens, waking paths, streams, waterfalls, heated pools & spas as you meander around this oceanfront complex. Prepare to be amazed by this stunning contemporary beach cottage! Travertine stone floors, stone floor-to-ceiling fireplace, plantation shutters, crown molding, exquisite furnishings. 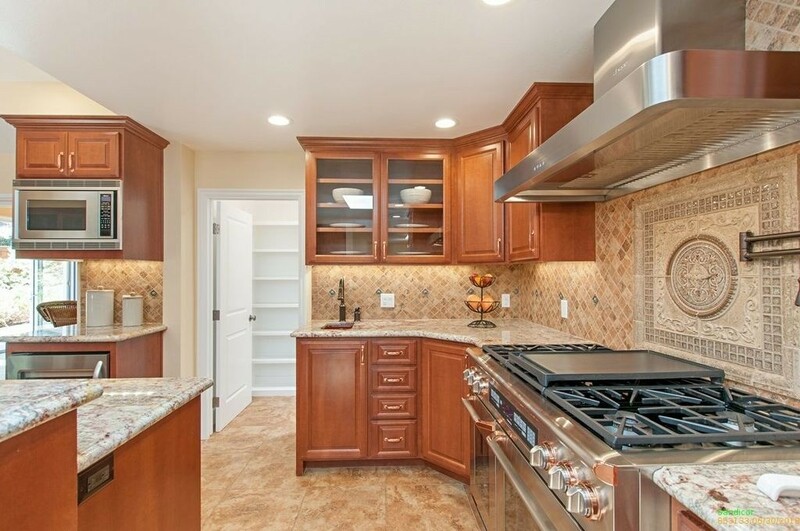 Slab granite kitchen with glass tile back splash, cherry cabinets and stainless appliances. The bath has gorgeous ledge stone wall and a glass bowl sink. Olympic size heated pool, spa, tropical grounds, waterfalls, streams, & Koi ponds. BBQ areas, exercise rooms, saunas, ping pong, billiards, putting green, & laundry rooms. This inviting and upscale condo is a welcome retreat after a day in the surf and sun! Additional upgrades include indirect lighting throughout living room, kitchen, and hallway, designer light fixtures, new vinyl windows and sliding door, skip troweled ceiling and walls with bull-nosed corners, custom soft-close cabinetry, under-counter lighting, and gorgeous travertine floor with granite edging. North Coast Village is located between the Oceanside Harbor and the Oceanside Pier. The complex consists of nine three-story buildings surrounded by 2-story cottages, on several acres of beautifully landscaped tropical paradise, with waterfalls, streams, and Koi ponds. You are just steps from the sand; there are no roads to cross-this is an OCEANFRONT COMPLEX! Swim in the large heated pool (one of two pools and spas), or enjoy a romantic walk on one of the most beautiful stretches of beach in Southern California. Experience spectacular sunsets and enjoy a relaxing dinner along the picturesque adjacent harbor which features several excellent restaurants, great live music, and fun and unique shopping. There are also kayak, boat, and paddle boat rentals, and fishing or whale watching excursions. North Coast Village offers billiards, ping pong, a fitness center with sauna, and a barbeque area overlooking the pool for parties. You will also find reserved garage parking, cable television, a recreation center, clubhouse with kitchen, massive stone fireplace and cedar walls, as well as laundry facilities. Buyer to verify all information before close of escrow. Sold before input to MLS North Coast Village is located between the Oceanside Harbor and the Oceanside Pier, and is a favorite vacation destination for couples and families from all over the world. The complex consists of nine three-story buildings on acres of beautifully landscaped grounds. Enjoy streams, waterfalls, Koi ponds, and fountains. You will feel like you're stepping into Maui! This is an outstanding opportunity- great vacation rental. You are just steps from the sand-this is an OCEANFRONT COMPLEX! Swim in the Olympic size heated pool (one of two pools and spas), or enjoy a romantic walk on one of the most beautiful stretches of beach in Southern California. Experience spectacular sunsets and enjoy a relaxing dinner along the picturesque adjacent harbor which features several excellent restaurants, great live music, and fun and unique shopping. There are also kayak, boat, and paddle boat rentals, and fishing or whale watching excursions. At the end of the Oceanside Pier you'll find Ruby's, a fun family restaurant. North Coast Village offers billiards, ping pong, a fitness center with sauna, putting green, and a barbeque area overlooking the pool for parties. You will also find reserved garage parking; cable television; recreation center; clubhouse with kitchen, massive stone fireplace and cedar walls; laundry in building; and elevator access to all floors. Buyer to verify all information before close of escrow. Welcome home! Situated in California Autumnwood. This home offers 3 bedrooms with an optional 4th bedroom (loft), 2.5 baths, vaulted ceilings, fireplace, family room, living room and your own backyard that has a retractable awning. This home is situated next to the Santee River Park that is adjacent to your backyard. Close to Santee Farmers Market, Shopping, Restaurants, Schools, the Sportsplex, Mast Park, Disc Golf Course and just minutes from Downtown San Diego and the Beaches. 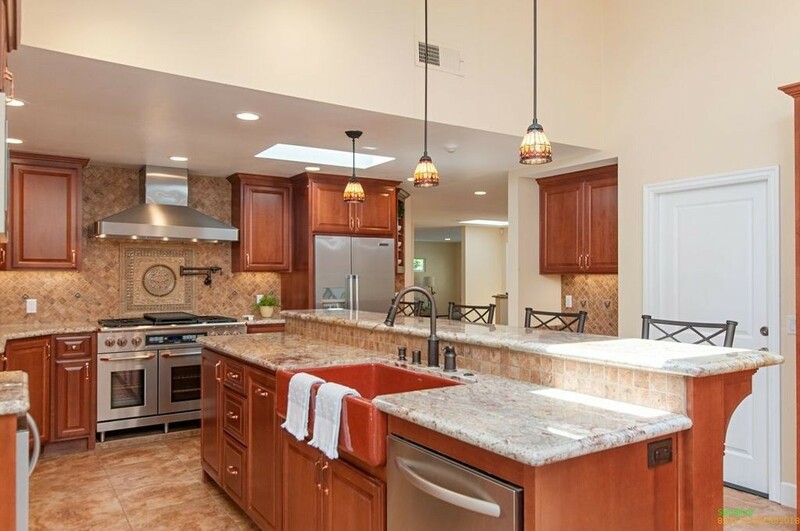 A gem of a townhome located in the Westridge gated community of San Elijo Hills. Walking distance to towncenter, fantastic schools, restaurants, grocery, dog-park and more! Rarely available 2-car garage townhome with ensuite bathrooms and extra half bath! Dual pane windows & Plantation shutters. Stainless steel appliances. Custom built storage in garage with epoxy flooring. Private low-maintenance yard. Upgraded A/C unit. Great neighborhood, perfect townhome, Amazing community! You’ll be greeted by ocean views the minute you step inside this bright, west-facing, top floor condominium in North Coast Village. Open the patio doors and you’ll hear the sound of the waves while watching the sailboats and surfers. Recent renovations to the unit include granite countertops, stainless steel appliances, tile-surround bath/shower and new carpet. Beveled mirrored walls in both the living room and bedroom help to greatly expand the sense of space in this home. Furnishings included! (cont.) Additional features include a tiled balcony, crown molding, recessed lighting, ceiling fans in LR and BR, re-textured skip troweled ceiling, and a tiled fireplace. North Coast Village offers billiards, ping pong, a fitness center with sauna, and a barbecue area overlooking the pool for parties. The complex consists of ten four-story buildings surrounded by 2-story cottages, on several acres of beautifully landscaped grounds with streams, waterfalls, and tropical gardens. You are just steps from the sand; there are no roads to cross-this is an OCEANFRONT COMPLEX! Swim in the large lagoon-style heated pool (one of two pools and spas), or enjoy a romantic walk on one of the most beautiful stretches of beach in Southern California. You will also find reserved garage parking, cable television, a recreation center, clubhouse with kitchen, massive stone fireplace and cedar walls, as well as laundry facilities. North Coast Village is located between the Oceanside Harbor and the Oceanside Pier, and is a favorite destination for people from around the world. This is a great area for riding bikes! A beautiful, scenic bike trail starts right across the street from the complex or bike along HISTORIC Pacific Coast Highway. Experience spectacular sunsets and enjoy a relaxing dinner along the picturesque adjacent harbor which features several excellent restaurants, great live music, and fun and unique shopping. There are also kayak, boat, and paddle boat rentals, and fishing or whale watching excursions. Downtown Oceanside is a neighborhood that knows its potential. With brand new renovations recently completed, new, exciting restaurants and hotels are opening all year! At the end of the Oceanside Pier you'll find Ruby's, a fun family restaurant. The Main Street Oceanside Farmer's Market is a delightful experience near the Pier which offers fresh produce every Thursday from 9-1, and the Sunset Market offering food booths from around the world and live music Thursday evenings from 5-9. Within a short drive, enjoy Disneyland, Knott's Berry Farm, Universal Studios, Legoland, Wild Animal Park, SeaWorld, San Diego Zoo, La Jolla, Balboa Park, the Gaslamp Distract and Del Mar Race Tracks. Craft beer capital of the US! Enjoy your favorites like Stone, Ballast Point and Green Flash or explore something new are creative at places like Masters in Oceanside! Single level, clean & sparkling located on a desirable street with private fenced yard. 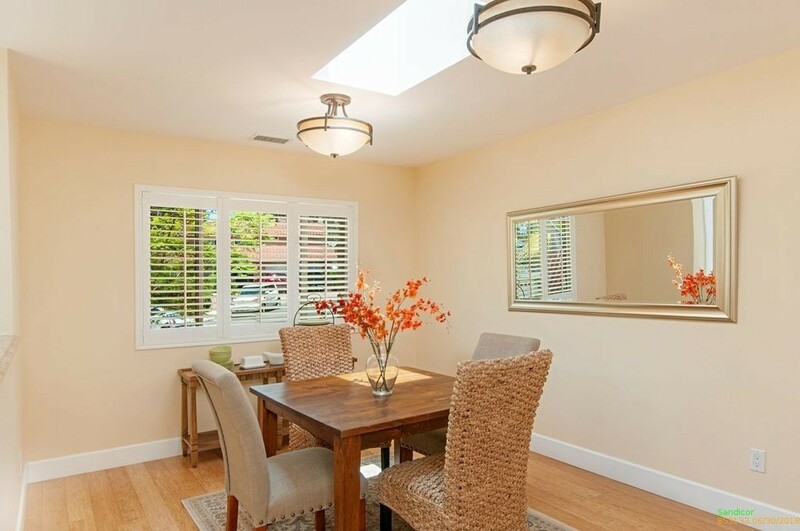 This home features, sparkling laminate oak flooring, three skylights, & spacious rooms. Lovingly maintained, roof has been replaced as well as A/C & furnace. All Windows & sliding doors have been replaced with energy efficient dual pane window/doors including the newer front door with side panels that open. Master bath has been remodeled. Kitchen is original but shines, with recessed lighting & newer appliances. Fencing on two sides replaced with new, repairs made to west side damaged boards. Community features common pool, BBQ, tennis courts, biking and hiking trails, clubhouse with exercise room and playground. Sold before input to MLS Located between Oceanside Harbor and Oceanside Pier, North Coast Village is a favorite destination for couples and families from around the world. This condo is able to be rented to vacationers by the week, or even by the day, making it an excellent investment opportunity! Buyer to verify all information before close of escrow. Price reduced! Great value, Live in the heart of San Diego! This home features 4 bedrooms 2.5 baths, great layout. This home is on a cul-de-sac with a park at the end of a cul-de-sac for every day use and entertainment. Luxurious, casual elegance describes this delightfully remodeled west-facing condo with ocean views from inside the condo! Lots of sunshine year-round! Watch the sailboats go by as you relax on your comfortable plush sofa. Slab granite counter tops and your own ocean-view balcony are just some of the amenities. This home is furnished and newly adorned with designer paint and carpet. North Coast Village offers billiards, ping pong, a fitness center with sauna, and a barbecue area overlooking the pool for parties. The complex consists of ten four-story buildings surrounded by 2-story cottages, on several acres of beautifully landscaped grounds with streams, waterfalls, and tropical gardens. You are just steps from the sand; there are no roads to cross-this is an OCEANFRONT COMPLEX! Swim in the large lagoon-style heated pool (one of two pools and spas), or enjoy a romantic walk on one of the most beautiful stretches of beach in Southern California. You will also find reserved garage parking, cable television, a recreation center, clubhouse with kitchen, massive stone fireplace and cedar walls, as well as laundry facilities. North Coast Village is located between the Oceanside Harbor and the Oceanside Pier, and is a favorite destination for people from around the world. This is a great area for riding bikes! A beautiful, scenic bike trail starts right across the street from the complex or bike along HISTORIC Pacific Coast Highway. Experience spectacular sunsets and enjoy a relaxing dinner along the picturesque adjacent harbor which features several excellent restaurants, great live music, and fun and unique shopping. There are also kayak, boat, and paddle boat rentals, and fishing or whale watching excursions. Downtown Oceanside is a neighborhood that knows its potential. With brand new renovations recently completed, new, exciting restaurants and hotels are opening all year! At the end of the Oceanside Pier you'll find Ruby's, a fun family restaurant. The Main Street Oceanside Farmer's Market is a delightful experience near the Pier which offers fresh produce every Thursday from 9-1, and the Sunset Market offering food booths from around the world and live music Thursday evenings from 5-9. Within a short drive, enjoy Disneyland, Knott's Berry Farm, Universal Studios, Legoland, Wild Animal Park, SeaWorld, San Diego Zoo, La Jolla, Balboa Park, the Gaslamp Distract and Del Mar Race Tracks. Craft beer capital of the US! Enjoy your favorites like Stone, Ballast Point and Green Flash or explore something new are creative at places like Masters in Oceanside! Fabulous whitewater ocean-view beach condo! This premium location on the third floor of the ocean-close E building provides vistas of the majestic Pacific ocean, North Coast Villages's heated pool, tropical paradise grounds, & putting green. Relax and enjoy watching the sailboats go by from your glass mosaic tiled breakfast bar. The comfortably furnished living room includes a pull-down Murphy Bed as well as a large flat-screen TV and DVD player. The kitchen and bath feature marble floors. Sold furnished! This condo is absolutely immaculate! Additional features include: bi-fold door for bedroom privacy, re-textured ceilings, mosaic glass tiled breakfast bar on balcony, 2 flat screen TV's and DVD players. Accent pillows and blue glass cannister in living room are not included. North Coast Village is located between the Oceanside Harbor and the Oceanside Pier, and is a favorite destination for people from around the world. The complex consists of nine three-story buildings surrounded by 2-story cottages, on several acres of beautifully landscaped grounds. You are just steps from the sand; there are no roads to cross-this is an OCEANFRONT COMPLEX! Swim in the Olympic sized heated pool (one of two pools and spas), or enjoy a romantic walk on one of the most beautiful stretches of beach in Southern California. Experience spectacular sunsets and enjoy a relaxing dinner along the picturesque adjacent harbor which features several excellent restaurants, great live music, and fun and unique shopping. There are also kayak, boat, and paddle boat rentals, and fishing or whale watching excursions. At the end of the Oceanside Pier you'll find Ruby's, a fun family restaurant. North Coast Village offers billiards, ping pong, a fitness center with sauna, and a barbeque area overlooking the pool for parties. You will also find reserved garage parking, cable television, a recreation center, clubhouse with kitchen, massive stone fireplace and cedar walls, as well as laundry facilities. The Mainstreet Oceanside Farmer's Market is a delightful experience near the Pier which takes place every Thursday from 9-1, and and the Sunset Market Thursday evenings from 5-9. Within a short drive, enjoy Disneyland, Knott's Berry Farm, Universal Studios, Legoland, Wild Animal Park, SeaWorld, San Diego Zoo, La Jolla, Del Mar Race Track, Sea Port Village, Catalina Island, Balboa Island, Hollywood, and Rodeo Drive. Amazing whitewater ocean, beach, and pier views from the moment you walk in the door! This coveted south-facing condo in the ocean-close D building of North Coast Village can be your own beach get-away. The prime corner location includes an extra window in the bedroom. Living room with cozy fireplace. Enjoy heated pools and hot tubs, saunas, gym, Koi ponds, BBQ area, waterfalls, streams, ping pong, billiards. Gated, guarded 24-hr security. Furniture not included. North Coast Village is located between the Oceanside Harbor and the Oceanside Pier, and is a favorite vacation destination for couples and families from all over the world. The complex consists of nine three-story buildings on acres of beautifully landscaped grounds. Enjoy streams, waterfalls, Koi ponds, and fountains. You will feel like you're stepping into Maui! You are just steps from the sand in this OCEANFRONT COMPLEX! Swim in the Olympic size heated pool (one of two pools and spas), or enjoy a romantic walk on one of the most beautiful stretches of beach in Southern California. Experience spectacular sunsets and enjoy a relaxing dinner along the picturesque adjacent harbor which features several excellent restaurants, great live music, and fun and unique shopping. There are also kayak, boat, and paddle boat rentals, and fishing or whale watching excursions. At the end of the Oceanside Pier you'll find Ruby's, a fun family restaurant. North Coast Village offers billiards, ping pong, a fitness center with sauna, putting green, and a barbeque area overlooking the pool for parties. You will also find reserved garage parking; cable television; recreation center; clubhouse with kitchen, massive stone fireplace and cedar walls; laundry in building; and elevator access. Buyer to verify all information before close of escrow. Wonderful west-facing OCEAN VIEW from the large master balcony of this light and bright 2BR, 2BA beach condo in beautiful OCEANFRONT North Coast Village! Tile kitchen, cozy brick fireplace, neutral carpet, tile floor in bathroom, and ceiling fan in dining area. Enjoy the Olympic size heated pool and spa, saunas, gym, ping pong, putting green, and billiards. Stroll through the lush grounds with waterfalls, streams, and Koi fish ponds. TROPICAL PARADISE--You'll think you stepped into Maui! A taste of Paradise! North Coast Village is located between the Oceanside Harbor and the Oceanside Pier. The complex consists of nine three-story buildings on acres of beautifully landscaped grounds. Enjoy streams, waterfalls, Koi ponds, and fountains. You will feel like you're stepping into Maui! You are just steps from the sand-this is an OCEANFRONT COMPLEX! Swim in the Olympic size heated pool (one of two pools and spas), or enjoy a romantic walk on one of the most beautiful stretches of beach in Southern California. Experience spectacular sunsets and enjoy a relaxing dinner along the picturesque adjacent harbor which features several excellent restaurants, great live music, and fun and unique shopping. There are also kayak, boat, and paddle boat rentals, and fishing or whale watching excursions. At the end of the Oceanside Pier you'll find Ruby's, a fun family restaurant. North Coast Village offers billiards, ping pong, a fitness center with sauna, putting green, and a barbecue area overlooking the pool for parties. You will also find reserved garage parking; cable television; recreation center; clubhouse with kitchen, massive stone fireplace and cedar walls; laundry in building; and elevator access to all floors. All furnishings belonged to former tenant and are not included in sale. Buyer to verify all information before close of escrow. Rarely available! Traditional sale! Unbelievable price! Enjoy marvelous views of the ocean, pool, stream, & gardens from the balcony of this south-facing, 2 BR, single-level beach condo. End unit with extra window and light in bedrooms. Many upgrades including new cabinets and track lighting in kitchen, wainscoting in bedroom, ceiling fan in dining room. North Coast Village is an ocean-front complex with gorgeous tropical grounds, heated pools & spas, gym, saunas, & clubhouse. Sold beautifully furnished! North Coast Village is located between the Oceanside Harbor and the Oceanside Pier, and is a favorite vacation destination for couples and families from all over the world. The complex consists of nine three-story buildings on acres of beautifully landscaped grounds. Enjoy streams, waterfalls, Koi ponds, and fountains. You will feel like you're stepping into Maui! You are just steps from the sand in this OCEANFRONT COMPLEX! Swim in the Olympic size heated pool (one of two pools and spas), or enjoy a romantic walk on one of the most beautiful stretches of beach in Southern California. Experience spectacular sunsets and enjoy a relaxing dinner along the picturesque adjacent harbor which features several excellent restaurants, great live music, and fun and unique shopping. There are also kayak, boat, and paddle boat rentals, and fishing or whale watching excursions. At the end of the Oceanside Pier you'll find Ruby's, a fun family restaurant. North Coast Village offers billiards, ping pong, a fitness center with sauna, putting green, and a barbeque area overlooking the pool for parties. You will also find reserved garage parking; cable television; recreation center; clubhouse with kitchen, massive stone fireplace and cedar walls; laundry in building; and elevator access. Buyer to verify all information before close of escrow. Spacious, tastefully remodeled OCEAN VIEW 2 BR single level condo at OCEANFRONT North Coast Village features plantation shutters & crown molding throughout, granite counter tops & back splash, stainless appliances, & custom cabinets. A granite fireplace warms the comfortably furnished living area. Recessed lighting, ceiling fans, mirrored closet, end unit. The secondary BR has a walk-in closet and walk-in shower. New vinyl sliding door and windows. Heated pool and spa, gym, saunas, BBQ's. 24-hr security. This gorgeous, immaculate condo has never been rented! Sold furnished with the exception of some seller-selected items. Located between Oceanside Harbor and Oceanside Pier, North Coast Village is a tropical oasis on the Pacific Ocean. The complex consists of nine three-story buildings surrounded by 2-story cottages, on several acres of beautifully landscaped grounds. You are just steps from the sand; there are no roads to cross-this is an OCEANFRONT COMPLEX! Swim in the Olympic sized heated pool (one of two pools and spas), or enjoy a romantic walk on one of the most beautiful stretches of beach in Southern California. Experience spectacular sunsets and enjoy a relaxing dinner along the picturesque adjacent harbor which features several excellent restaurants, great live music, and fun and unique shopping. There are also kayak, boat, and paddle boat rentals, and fishing or whale watching excursions. At the end of the Oceanside Pier you'll find Ruby's, a fun family restaurant. North Coast Village offers billiards, ping pong, a fitness center with sauna, and a barbecue area overlooking the pool for parties. You will also find reserved garage parking; cable television; recreation center; clubhouse with kitchen, massive stone fireplace and cedar walls; laundry facilities. Buyer to verify all information before close of escrow. This extremely desirable location in the premier OCEANFRONT complex of North Coast Village features a great ocean view, and overlooks the pool and beautiful gardens, streams, and putting green. This south-facing condo gets plenty of sun, has tile kitchen and bath floors, mirrored wardrobes, and neutral berber carpet. Easy beach access, no roads to cross! Make your dream of owning your own beach condo come true, and let others pay for it by renting it out for vacations by the month, week, or day! Almost all furnishings included! North Coast Village offers billiards, ping pong, a fitness center with sauna, and a barbecue area overlooking the pool for parties. The complex consists of ten four-story buildings surrounded by 2-story cottages, on several acres of beautifully landscaped grounds with streams, waterfalls, and tropical gardens. You are just steps from the sand; there are no roads to cross-this is an OCEANFRONT COMPLEX! Swim in the large lagoon-style heated pool (one of two pools and spas), or enjoy a romantic walk on one of the most beautiful stretches of beach in Southern California. You will also find reserved garage parking, cable television, a recreation center, clubhouse with kitchen, massive stone fireplace and cedar walls, as well as laundry facilities. North Coast Village is located between the Oceanside Harbor and the Oceanside Pier, and is a favorite destination for people from around the world. This is a great area for riding bikes! A beautiful, scenic bike trail starts right across the street from the complex or bike along HISTORIC Pacific Coast Highway. Experience spectacular sunsets and enjoy a relaxing dinner along the picturesque adjacent harbor which features several excellent restaurants, great live music, and fun and unique shopping. There are also kayak, boat, and paddle boat rentals, and fishing or whale watching excursions. Downtown Oceanside is a neighborhood that knows its potential. With brand new renovations recently completed, new, exciting restaurants and hotels are opening all year! At the end of the Oceanside Pier you'll find Ruby's, a fun family restaurant. The Main Street Oceanside Farmer's Market is a delightful experience near the Pier which offers fresh produce every Thursday from 9-1, and the Sunset Market offering food booths from around the world and live music Thursday evenings from 5-9. Within a short drive, enjoy Disneyland, Knott's Berry Farm, Universal Studios, Legoland, Wild Animal Park, SeaWorld, San Diego Zoo, La Jolla, Balboa Park, the Gaslamp Distract and Del Mar Race Tracks. Craft beer capital of the US! Enjoy your favorites like Stone, Ballast Point and Green Flash or explore something new are creative at places like Masters in Oceanside! WOW! Experience panoramic ocean, harbor, mountain, jetty, and river views from inside this North Coast Village condo as well as from the balcony. Enjoy all the amenities North Coast Village has to offer including year-round heated pools, spas, OCEANFRONT tropical paradise grounds, putting green, exercise rooms, saunas, ping pong, foosball, BBQ area by pool, & Koi pond. Just steps to the beach with no roads to cross! North Coast Village is located between the Oceanside Harbor and the Oceanside Pier, and is a favorite destination for people from around the world. The complex consists of nine three-story buildings surrounded by 2-story cottages, on several acres of beautifully landscaped grounds. You are just steps from the sand; there are no roads to cross-this is an OCEANFRONT COMPLEX! Swim in the Olympic sized heated pool (one of two pools and spas), or enjoy a romantic walk on one of the most beautiful stretches of beach in Southern California. Experience spectacular sunsets and enjoy a relaxing dinner along the picturesque adjacent harbor which features several excellent restaurants, great live music, and fun and unique shopping. There are also kayak, boat, and paddle boat rentals, and fishing or whale watching excursions. At the end of the Oceanside Pier you'll find Ruby's, a fun family restaurant. North Coast Village offers billiards, ping pong, a fitness center with sauna, and a barbeque area overlooking the pool for parties. You will also find reserved garage parking, cable television, a recreation center, clubhouse with kitchen, massive stone fireplace and cedar walls, as well as laundry facilities. The Mainstreet Oceanside Farmer's Market is a delightful experience near the Pier which takes place every Thursday from 9-1, and and the Sunset Market Thursday evenings from 5-9. Within a short drive, enjoy Disneyland, Knott's Berry Farm, Universal Studios, Legoland, Wild Animal Park, SeaWorld, San Diego Zoo, La Jolla, Del Mar Race Track, Sea Port Village, Catalina Island, Balboa Island, Hollywood, and Rodeo Drive. Buyer to verify all information before close of escrow. Picture yourself just steps from the sand in this beautiful OCEAN VIEW two-bedroom "cottage" at Oceanfront North Coast Village. This first floor condo features a wood-burning fireplace, plus an ocean view patio surrounded by lovely flowers and grass! The A building has its own heated pool, jacuzzi, BBQ, ping pong, and laundry. Just a short stroll to the pier, marina, shops, dining, theater & Coaster or Amtrak. Also enjoy waterfalls, streams, gym, saunas, billiards, KOi ponds, and whale watching. Your own private beach retreat! North Coast Village is located between the Oceanside Harbor and the Oceanside Pier, and is a favorite destination for both couples and families from around the world. The complex consists of nine three-story buildings surrounded by 2-story cottages, on several acres of beautifully landscaped grounds.. You are just steps from the sand; there are no roads to cross-this is an OCEANFRONT COMPLEX! Swim in the Olympic sized heated pool (one of two pools and spas), or enjoy a romantic walk on one of the most beautiful stretches of beach in Southern California. Experience spectacular sunsets and enjoy a relaxing dinner along the picturesque adjacent harbor which features several excellent restaurants, great live music, and fun and unique shopping. There are also kayak, boat, and paddle boat rentals, and fishing or whale watching excursions. At the end of the Oceanside Pier you'll find Ruby's, a fun family restaurant. North Coast Village offers billiards, ping pong, a fitness center with sauna, and a barbeque area overlooking the pool for parties. You will also find reserved garage parking; cable television; recreation center; clubhouse with kitchen, massive stone fireplace and cedar walls; laundry facilities. Range, refrigerator, and furnishings do not convey. Buyer to verify all information before close of escrow. AWESOME 3 BEDROOM/2 BATH modern contemporary condo in a small 6 unit complex in University Heights. Lower unit, one car garage with direct access into condo, plus one extra assigned parking spot. Wonderfully upgraded baths and kitchen with granite counters & stainless appliances, gleaming mfg. wood flooring, walk in closet in master. This property sparkles, it's spacious open floor plan feels larger than it's sq.ft. and makes it easy to love. Low HOA fees. Excellent location, close to shopping and park. Amazing Opportunity! Enjoy gorgeous sunsets on the water from both upper and lower balconies of this Ocean View 2BR, 2BA penthouse condominium. Located in the coveted D Building, with close proximity to the beach, marina and pier. Enjoy gorgeous, lush tropical grounds with streams, waterfalls, Koi fish ponds, 2 heated pools and hot tubs, gym, saunas. 24-hr guarded, gated security. Located between Oceanside Harbor and Oceanside Pier, North Coast Village is a tropical oasis on the Pacific Ocean. The complex consists of nine three-story buildings surrounded by 2-story cottages, on several acres of beautifully landscaped grounds. You are just steps from the sand; there are no roads to cross-this is an OCEANFRONT COMPLEX! Swim in the Olympic sized heated pool (one of two pools and spas), or enjoy a romantic walk on one of the most beautiful stretches of beach in Southern California. Experience spectacular sunsets and enjoy a relaxing dinner along the picturesque adjacent harbor which features several excellent restaurants, great live music, and fun and unique shopping. There are also kayak, boat, and paddle boat rentals, and fishing or whale watching excursions. At the end of the Oceanside Pier you'll find Ruby's, a fun family restaurant. North Coast Village offers billiards, ping pong, a fitness center with sauna, and a barbecue area overlooking the pool for parties. You will also find reserved garage parking; cable television; recreation center; clubhouse with kitchen, massive stone fireplace and cedar walls; laundry facilities. Buyer to verify all information before close of escrow. Feast your eyes as you enter this beautiful, luxurious beach home at North Coast Village. It has been totally refurbished including a granite kitchen, all new floors, new furniture, and only a few feet from a 12' waterfall! Open the windows and all you hear is the waterfall and the tropical birds in the garden area. Relax in the brand new luxury spa shower! You'll feel like you are truly in a unique paradise jungle! This is a garden view unit, with a peek of ocean looking through the tropical gardens. Almost all furnishings included! North Coast Village offers billiards, ping pong, a fitness center with sauna, and a barbecue area overlooking the pool for parties. The complex consists of ten four-story buildings surrounded by 2-story cottages, on several acres of beautifully landscaped grounds with streams, waterfalls, and tropical gardens. You are just steps from the sand; there are no roads to cross-this is an OCEANFRONT COMPLEX! Swim in the large lagoon-style heated pool (one of two pools and spas), or enjoy a romantic walk on one of the most beautiful stretches of beach in Southern California. You will also find reserved garage parking, cable television, a recreation center, clubhouse with kitchen, massive stone fireplace and cedar walls, as well as laundry facilities. North Coast Village is located between the Oceanside Harbor and the Oceanside Pier, and is a favorite destination for people from around the world. This is a great area for riding bikes! A beautiful, scenic bike trail starts right across the street from the complex or bike along HISTORIC Pacific Coast Highway. Experience spectacular sunsets and enjoy a relaxing dinner along the picturesque adjacent harbor which features several excellent restaurants, great live music, and fun and unique shopping. There are also kayak, boat, and paddle boat rentals, and fishing or whale watching excursions. Downtown Oceanside is a neighborhood that knows its potential. With brand new renovations recently completed, new, exciting restaurants and hotels are opening all year! At the end of the Oceanside Pier you'll find Ruby's, a fun family restaurant. The Main Street Oceanside Farmer's Market is a delightful experience near the Pier which offers fresh produce every Thursday from 9-1, and the Sunset Market offering food booths from around the world and live music Thursday evenings from 5-9. Within a short drive, enjoy Disneyland, Knott's Berry Farm, Universal Studios, Legoland, Wild Animal Park, SeaWorld, San Diego Zoo, La Jolla, Balboa Park, the Gaslamp Distract and Del Mar Race Tracks. Craft beer capital of the US! Enjoy your favorites like Stone, Ballast Point and Green Flash or explore something new are creative at places like Masters in Oceanside! It'd be impossible to forget your proximity to the beach in this home. From the moment you walk in the door, you are greeted with beautiful ocean views that permeate throughout this west-facing condominium! Casual meets luxury with an upgraded kitchen, upgraded bathroom counters and shower, living room fireplace, beautiful accent walls and tiled floors. This is an easily accessible home to the beach, pool, bbq, and many other amenities both in the complex and in the neighborhood. North Coast Village offers billiards, ping pong, a fitness center with sauna, and a barbecue area overlooking the pool for parties. The complex consists of ten four-story buildings surrounded by 2-story cottages, on several acres of beautifully landscaped grounds with streams, waterfalls, and tropical gardens. You are just steps from the sand; there are no roads to cross-this is an OCEANFRONT COMPLEX! Swim in the large lagoon-style heated pool (one of two pools and spas), or enjoy a romantic walk on one of the most beautiful stretches of beach in Southern California. You will also find reserved garage parking, cable television, a recreation center, clubhouse with kitchen, massive stone fireplace and cedar walls, as well as laundry facilities. North Coast Village is located between the Oceanside Harbor and the Oceanside Pier, and is a favorite destination for people from around the world. This is a great area for riding bikes! A beautiful, scenic bike trail starts right across the street from the complex or bike along HISTORIC Pacific Coast Highway. Experience spectacular sunsets and enjoy a relaxing dinner along the picturesque adjacent harbor which features several excellent restaurants, great live music, and fun and unique shopping. There are also kayak, boat, and paddle boat rentals, and fishing or whale watching excursions. Downtown Oceanside is a neighborhood that knows its potential. With brand new renovations recently completed, new, exciting restaurants and hotels are opening all year! At the end of the Oceanside Pier you'll find Ruby's, a fun family restaurant. The Main Street Oceanside Farmer's Market is a delightful experience near the Pier which offers fresh produce every Thursday from 9-1, and the Sunset Market offering food booths from around the world and live music Thursday evenings from 5-9. Within a short drive, enjoy Disneyland, Knott's Berry Farm, Universal Studios, Legoland, Wild Animal Park, SeaWorld, San Diego Zoo, La Jolla, Balboa Park, the Gaslamp Distract and Del Mar Race Tracks. Craft beer capital of the US! Enjoy your favorites like Stone, Ballast Point and Green Flash or explore something new are creative at places like Masters in Oceanside! Charming ocean-view beach condo in the coveted ocean-close D building of North Coast Village. Savor the breath-taking views of surf, sand, pool, and beautiful tropical gardens from your own balcony! Relax in your living room with cozy fireplace. Enjoy heated pools and hot tubs, saunas, gym, Koi ponds, BBQ area, waterfalls, streams, ping pong, billiards. Gated, guarded 24-hr security. Furniture not included. North Coast Village is located between the Oceanside Harbor and the Oceanside Pier, and is a favorite vacation destination for couples and families from all over the world. The complex consists of nine three-story buildings on acres of beautifully landscaped grounds. Enjoy streams, waterfalls, Koi ponds, and fountains. You will feel like you're stepping into Maui! You are just steps from the sand in this OCEANFRONT COMPLEX! Swim in the Olympic size heated pool (one of two pools and spas), or enjoy a romantic walk on one of the most beautiful stretches of beach in Southern California. Experience spectacular sunsets and enjoy a relaxing dinner along the picturesque adjacent harbor which features several excellent restaurants, great live music, and fun and unique shopping. There are also kayak, boat, and paddle boat rentals, and fishing or whale watching excursions. At the end of the Oceanside Pier you'll find Ruby's, a fun family restaurant. North Coast Village offers billiards, ping pong, a fitness center with sauna, putting green, and a barbeque area overlooking the pool for parties. You will also find reserved garage parking; cable television; recreation center; clubhouse with kitchen, massive stone fireplace and cedar walls; laundry in building; and elevator access. Buyer to verify all information before close of escrow. What an amazing opportunity to own this charming, spacious canyon view home! Gorgeous vaulted open-beam ceilings throughout, French doors leading to stone patio and large private yard with fountain, master retreat with sitting area or office, and walk-in closet. All appliances and washer/dryer convey! Beautiful tile flooring in kitchen and living room. Central air, brand new water heater, gas stove. One-car attached garage. Walk to park, close to all. Buyer to verify all information before close of escrow. Assessor records show higher square footage. Great opportunity in the highly sought after Genesee Highlands! Spacious 1BR/1BA, 945sq ft. New double pane windows create a light and bright feel in this top floor single level condo. Great investment or starter home! Unit also features a large balcony off of the living room, in-unit laundry room with full size w/d,His & Her closets, locked storage space in garage plus an exterior closet. Complex has a pool, park & playground.Walk to UCSD, food, shopping, parks, canyon,MTS trolley line & freeway access. A perfect investment or starter home with endless upgrade possibilities! 1 spot in attached & shared garage, 1 spot in driveway as well as ample guest parking. Unit located steps from beautiful park, garden & pool! A very quiet neighborhood centrally located with the ability to walk to UCSD, restaurants, parks, direct canyon access, shopping/mall, MTS trolley line, with nearby freeway access. No showings before scheduled OPEN HOUSES Saturday 2/23 from 2pm-4pm & Sunday 2/24 from 11am-2pm. Owner occupied, no lockbox. Sold before input in MLS. Prepared to be surprised by AMAZING OCEAN VIEWS to Catalina from the moment you walk in the door! As you move toward the balcony, harbor, and mountain views also come into sight. Amenities include heated pool, spa, tropical paradise grounds, putting green, exercise rooms, saunas, ping pong, foosball, BBQ area by pool, Koi pond, steps to the beach with no roads to cross. North Coast Village is located between the Oceanside Harbor and the Oceanside Pier, and is a favorite destination for people from around the world. The complex consists of nine three-story buildings surrounded by 2-story cottages, on several acres of beautifully landscaped grounds. You are just steps from the sand; there are no roads to cross-this is an OCEANFRONT COMPLEX! Swim in the Olympic sized heated pool (one of two pools and spas), or enjoy a romantic walk on one of the most beautiful stretches of beach in Southern California. Experience spectacular sunsets and enjoy a relaxing dinner along the picturesque adjacent harbor which features several excellent restaurants, great live music, and fun and unique shopping. There are also kayak, boat, and paddle boat rentals, and fishing or whale watching excursions. At the end of the Oceanside Pier you'll find Ruby's, a fun family restaurant. North Coast Village offers billiards, ping pong, a fitness center with sauna, and a barbeque area overlooking the pool for parties. You will also find reserved garage parking, cable television, a recreation center, clubhouse with kitchen, massive stone fireplace and cedar walls, as well as laundry facilities. The Mainstreet Oceanside Farmer's Market is a delightful experience near the Pier which takes place every Thursday from 9-1, and and the Sunset Market Thursday evenings from 5-9. Within a short drive, enjoy Disneyland, Knott's Berry Farm, Universal Studios, Legoland, Wild Animal Park, SeaWorld, San Diego Zoo, La Jolla, Del Mar Race Track, Sea Port Village, Catalina Island, Balboa Island, Hollywood, and Rodeo Drive. Views of the surf, sand, & ocean are yours to enjoy from this top floor, 1BR cottage in Oceanfront North Coast Village. Wood-burning fireplace, no hallways - enter through your own private door. A beautiful setting with a spacious floor plan. The grounds will remind you of Maui with lush tropical foliage, meandering streams, waterfalls, Koi ponds, and putting green. Two heated pools, jacuzzis, gym, saunas, billiards, ping pong, BBQ's, rec room, large party room w/stone fireplace. Your own private beach retreat! Sold furnished. North Coast Village is located between the Oceanside Harbor and the Oceanside Pier, and is a favorite destination for people around the world. The complex consists of nine three-story buildings surrounded by 2-story cottages, on several acres of beautifully landscaped grounds. You are just steps from the sand; there are no roads to cross-this is an OCEANFRONT COMPLEX! Swim in the Olympic sized heated pool (one of two pools and spas), or enjoy a romantic walk on one of the most beautiful stretches of beach in Southern California. Experience spectacular sunsets and enjoy a relaxing dinner along the picturesque adjacent harbor which features several excellent restaurants, great live music, and fun and unique shopping. There are also kayak, boat, and paddle boat rentals, and fishing or whale watching excursions. At the end of the Oceanside Pier you'll find Ruby's, a fun family restaurant. North Coast Village offers billiards, ping pong, a fitness center with sauna, and a barbecue area overlooking the pool for parties. You will also find reserved garage parking; cable television; recreation center; clubhouse with kitchen, massive stone fireplace and cedar walls; laundry facilities. Buyer to verify all information before close of escrow. Here's a great opportunity to own at OCEANFRONT North Coast Village at a very affordable price! Beautifully remodeled condo with lovely garden view and some ocean view. You'll find 20-inch tile throughout, re-textured ceilings, newer sliding door and window. Experience all NCV has to offer: 2 year-round heated pools and spas, BBQ's, lushly landscaped gardens with waterfalls and streams, exercise rooms, saunas, putting green. 24-hr guarded, gated security. A taste of Paradise! North Coast Village is located between the Oceanside Harbor and the Oceanside Pier, and is a favorite vacation destination for couples and families from all over the world. The complex consists of nine three-story buildings on acres of beautifully landscaped grounds. Enjoy streams, waterfalls, koi ponds, and fountains. You will feel like you're stepping into Maui! This is an outstanding opportunity- this condo is rentable by the week or even by the day. You are just steps from the sand-this is an OCEANFRONT COMPLEX! Swim in the Olympic size heated pool (one of two pools and spas), or enjoy a romantic walk on one of the most beautiful stretches of beach in Southern California. Experience spectacular sunsets and enjoy a relaxing dinner along the picturesque adjacent harbor which features several excellent restaurants, great live music, and fun and unique shopping. There are also kayak, boat, and paddle boat rentals, and fishing or whale watching excursions. At the end of the Oceanside Pier you'll find Ruby's, a fun family restaurant. North Coast Village offers billiards, ping pong, a fitness center with sauna, putting green, and a barbeque area overlooking the pool for parties. You will also find reserved garage parking; cable television; recreation center; clubhouse with kitchen, massive stone fireplace and cedar walls; laundry in building; and elevator access to all floors. Note that photos are from a previous listing. To see current photos contact listing agent. Buyer to verify all information before close of escrow. PANORAMIC OCEAN VIEWS are yours to enjoy every day from this two bedroom penthouse in ocean front North Coast Village. Steps from the sand, this south-facing condo has plenty of sunshine and light! Within walking distance of the Oceanside Pier and Harbor, NCV features a heated Olympic size pool, spa, gym, saunas, BBQ areas, ping pong, billiards, and putting green. 24 hour gated, guarded security. Furniture, appliances, and all items in the home are excluded. A taste of Paradise! North Coast Village is located between the Oceanside Harbor and the Oceanside Pier, and is a favorite vacation destination for couples and families from all over the world. The complex consists of nine three-story buildings on acres of beautifully landscaped grounds. Enjoy streams, waterfalls, koi ponds, and fountains. You will feel like you're stepping into Maui! This is an outstanding opportunity- this condo is rentable by the week or even by the day. You are just steps from the sand in this OCEANFRONT COMPLEX! Swim in the Olympic size heated pool (one of two pools and spas), or enjoy a romantic walk on one of the most beautiful stretches of beach in Southern California. Experience spectacular sunsets and enjoy a relaxing dinner along the picturesque adjacent harbor which features several excellent restaurants, great live music, and fun and unique shopping. There are also kayak, boat, and paddle boat rentals, and fishing or whale watching excursions. At the end of the Oceanside Pier you'll find Ruby's, a fun family restaurant. North Coast Village offers billiards, ping pong, a fitness center with sauna, putting green, and a barbeque area overlooking the pool for parties. You will also find reserved garage parking; cable television; recreation center; clubhouse with kitchen, massive stone fireplace and cedar walls; laundry in building; and elevator access. Buyer to verify all information before close of escrow. Information is believed to be reliable, but not guaranteed. Your next renovation project awaits in the suburban Grossmont Hills corner of La Mesa. This home is in need of repairs, but is oriented well on a good sized lot. Mature vegetation is lush throughout the exterior of the home. A front and back deck allow outdoor entertainment. The garage is detached and set back, leaving plenty of room for parking. Fabulous home not on the busy side of Jamacha Blvd. Bright, light & loaded with upgrades. Remodeled huge family sized kitchen w/granite counters, stainless appliances, granite composite double sink & beautiful cabinetry. Spacious living room, 18" ceramic tile flooring, A/C, New dual pane windows and sliding door. New roof & gutters, Custom window blinds, lighting, Alarm system, Mirrored wardrobe doors in master suite. Private fenced front yard. Low maintenance backyard w/fruit trees & big patio. Accent lighting in kitchen, living room and second bedroom. 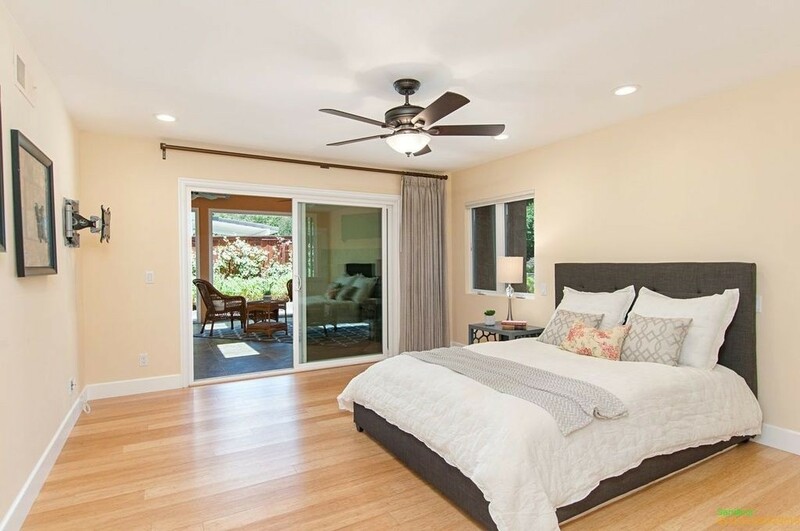 Ceiling fan in master bedroom, 3 ton Carrier HVAC system with Central air purifier w/humidity control. Upgraded glass lighted Solatube in bathroom. New front yard fencing. One garage has been upgraded with drywall, textured and painted and has tile large tile flooring and Solatube lighting fixture. Private park like view from backyard. This tastefully appointed Ocean view beach condo in beautiful Oceanfront North Coast Village features a mirrored living room wall, newer carpet, warm neutral paint, re-textured ceilings, and tile counters and floor in the kitchen. Enjoy the Olympic size heated pool and spa, saunas, gym, ping pong, putting green, and billiards. Stroll through the lush grounds with waterfalls, streams, and Koi fish ponds. Twenty-four hour guarded, gated security, parking garage with assigned space, easy beach access. Your own private beach retreat! North Coast Village is located between the Oceanside Harbor and the Oceanside Pier, and is a favorite destination for both couples and families from around the world. The complex consists of nine three-story buildings surrounded by 2-story cottages, on several acres of beautifully landscaped grounds. The units are rentable by the week or even by the day. This is an outstanding investment opportunity. You are just steps from the sand; there are no roads to cross-this is an OCEANFRONT COMPLEX! Swim in the Olympic sized heated pool (one of two pools and spas), or enjoy a romantic walk on one of the most beautiful stretches of beach in Southern California. Experience spectacular sunsets and enjoy a relaxing dinner along the picturesque adjacent harbor which features several excellent restaurants, great live music, and fun and unique shopping. There are also kayak, boat, and paddle boat rentals, and fishing or whale watching excursions. At the end of the Oceanside Pier you'll find Ruby's, a fun family restaurant. North Coast Village offers billiards, ping pong, a fitness center with sauna, and a barbeque area overlooking the pool for parties. You will also find reserved garage parking; cable television; recreation center; clubhouse with kitchen, massive stone fireplace and cedar walls; laundry facilities. Buyer to verify all information before close of escrow. Updated 2 Bed & 2.5 Bath 1200 sqft + townhouse with one car garage and one assigned space. New wood laminate floors throughout the home, updated kitchen w granite countertops, travertine backsplash & stainless steel appliances. Washer & dryer hookups. Remodeled baths w granite countertops, new bathtub. New water heater. Washer/Dryer/Refridge will be included. Fully fenced patio that backs park-like open space. Beautiful nature all around. No neighbors above or below you. Home is 5 miles from the beach! Enjoy living in this luxury condo in the heart of Carmel Valley. Walk to several parks, the library, community center, shopping, dinning, the movie theater and more! Just minutes from the ocean, major employment centers, and located in the highly sought after Del Mar Union school district, this condo's location can't be beat! Hardwood floors, granite countertops, stainless steel appliances, and the large serene terrace makes this condo luxury living at its best! Upper end corner unit. One Bedroom + Loft. Bright and light with laminate flooring, vaulted ceilings, celestial window in living room, ceiling fan in bedroom and cheerfully painted interior. Kitchen upgrades with glass block back splash tiling and stainless appliances. Inside stacked washer and dryer. Good sized upper loft, great for office/guest room. One carport parking space and plenty of secondary parking. Community pool and spa. Close to shopping, theaters, and fine dining. DIRECT WEST-FACING CONDO WITH FABULOUS OCEAN VIEWS!! This is one of the premium condos in North Coast Village, with a great ocean view from the moment you walk in the door! Tumbled travertine counter tops, stone fireplace, and exquisite decor. Excellent vacation rental with great rental history. Located within walking distance to Oceanside Pier and the Harbor. Olympic size heated pool, large spa, waterfalls, streams, Koi ponds, putting green, gym, saunas, ping pong, billiards, great clubhouse. Your own private beach retreat! North Coast Village is located between the Oceanside Harbor and the Oceanside Pier, and is a favorite destination for both couples and families from around the world. The complex consists of nine three-story buildings surrounded by 2-story cottages, on several acres of beautifully landscaped grounds. The units are rentable by the week or even by the day. This is an outstanding investment opportunity. You are just steps from the sand; there are no roads to cross-this is an OCEANFRONT COMPLEX! Swim in the Olympic sized heated pool (one of two pools and spas), or enjoy a romantic walk on one of the most beautiful stretches of beach in Southern California. Experience spectacular sunsets and enjoy a relaxing dinner along the picturesque adjacent harbor which features several excellent restaurants, great live music, and fun and unique shopping. There are also kayak, boat, and paddle boat rentals, and fishing or whale watching excursions. At the end of the Oceanside Pier you'll find Ruby's, a fun family restaurant. North Coast Village offers billiards, ping pong, a fitness center with sauna, and a barbeque area overlooking the pool for parties. You will also find reserved garage parking; cable television; recreation center; clubhouse with kitchen, massive stone fireplace and cedar walls; laundry facilities. Range, refrigerator, and furnishings do not convey. Buyer to verify all information before close of escrow. Great location in the complex! This 1 bedroom on the ground level w/ no stairs is the perfect cozy home or investment property! Features include granite counters, stainless appliances, tile & carpet, stacked washer & dryer, large private patio, & assigned carport space only steps away. Villa Taviana is a well maintained complex with beautiful stonework & offers tennis, pool, spa, BBQ, gym, clubhouse & playground! In award winning Poway School District & close to restaurants, shopping, freeway! FABULOUS OCEAN & MARINA VIEWS are yours to enjoy from this luxury beach condo in OCEANFRONT North Coast Village! This is an exquisite setting, rarely available, and features a newer sliding door & window as well as retextured ceilings. Walk to the Oceanside Harbor & Pier, see romantic sunsets, swim in the Olympic size pool (one of two pools & spas), & stroll along one of the most beautiful beaches in S. Cal! Lush tropical grounds with waterfalls and streams, BBQs, putting green, Koi ponds, gym, saunas. A taste of Paradise! North Coast Village is located between the Oceanside Harbor and the Oceanside Pier. The complex consists of nine three-story buildings on acres of beautifully landscaped grounds. Enjoy streams, waterfalls, Koi ponds, and fountains. You will feel like you're stepping into Maui! You are just steps from the sand-this is an OCEANFRONT COMPLEX! Swim in the Olympic size heated pool (one of two pools and spas), or enjoy a romantic walk on one of the most beautiful stretches of beach in Southern California. Experience spectacular sunsets and enjoy a relaxing dinner along the picturesque adjacent harbor which features several excellent restaurants, great live music, and fun and unique shopping. There are also kayak, boat, and paddle boat rentals, and fishing or whale watching excursions. At the end of the Oceanside Pier you'll find Ruby's, a fun family restaurant. North Coast Village offers billiards, ping pong, a fitness center with sauna, putting green, and a barbecue area overlooking the pool for parties. You will also find reserved garage parking; cable television; recreation center; clubhouse with kitchen, massive stone fireplace and cedar walls; laundry in building; and elevator access to all floors. Buyer to verify all information before close of escrow. Love a spectacular view and want to sleep to the sounds of the ocean? Then this ocean front rental - 2 bedroom/2 bath condo is for you. Love at first sight. Fully furnished, 3 mo. minimum to 6 mo. max. Newly remodeled and upgraded. Lots to love and only minutes to the heart of La Jolla for fine dining and shopping.The large patio is a bonus to enjoy the panoramic views, ocean breeze, and only steps away from the sandy beach. FURNISHED. Live the good life. Steps to the ocean with ocean views from living room balcony. Remodeled, upgraded and move in ready with stone and tile flooring, no carpet. Shows light and bright, unique property with several different patio areas. Spacious living/dining room, big kitchen with granite counters and stainless appliances, great for entertaining. There is both an eating nook and formal dining area. Master suite is spacious with luxurious step in shower and dual high bowl sinks. Walk to Del Mar Highlands, One Paseo, Cinepolis, Great restaurants, Library and more. Minutes to Del Mar Beaches, Del Mar Village, Del Mar Racetrack and Fairgrounds. 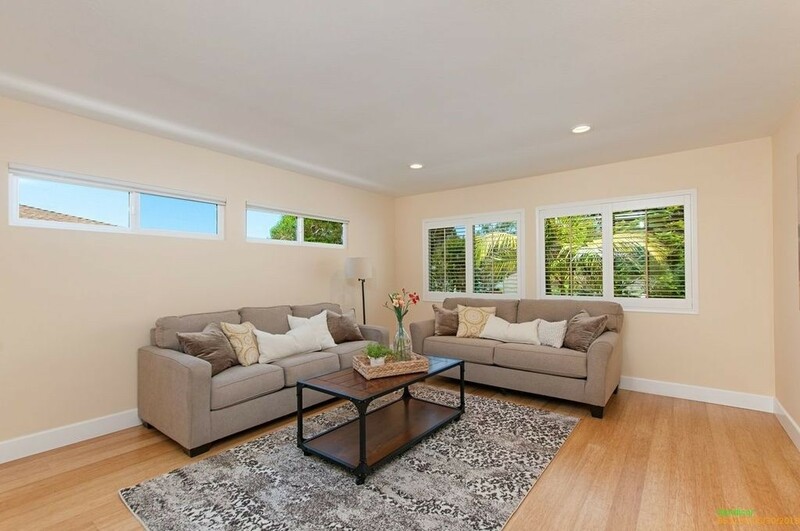 Easy freeway access and top rated Del Mar Schools.